As R&R Charters and Sail School begins its 10th year in business, it's good to reflect upon the reason I decided to begin my own sailing school. 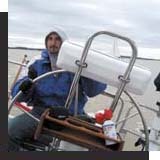 Prior to 2006, I had taught sailing for various schools on the Chesapeake Bay. Most of them had large facilities with many instructors, vessels, and several paid office staff. With a large facility and lots of overhead, these schools would often require a minimum number of students be registered for each class. As a result, a few days before the class was scheduled to begin, I would receive a phone call informing me that my class was canceled due to insufficient class enrollment. Not only was it inconvenient for me, but the students also had to rearrange their schedule to fit into another time slot. When I began my school, I vowed I would never reschedule or cancel a class as long as I had one person registered for that class. And I do not expect students to pay additional for “private” class instruction. R&R Charters and Sail School will never change this policy! R&R Charters and Sail School might be small in comparison, but all our instructors know each other. We are a family sharing our passion for sailing with our students who choose to become part of our extended family. With the arrival of computers and internet technology, I have noticed more and more sailing schools are offering online courses for ASA 105 and ASA 107. As a retired public school teacher, I have to question how effective these classes really are. I find most of my students want close interaction with their instructor. During the last 12 years of my teaching career, I actually taught German through a long distance learning program. It was not unusual for me to be teaching students via phone/TV connection who were 50 or more miles away from me. During the year, I made it a point to visit each of these schools to speak with my students in person. Without that personal connection I was just an image and voice coming to them electronically. Students only excel through personal connection. That is true for high school students as well as sailing students. Technology is great, but it is the personal face to face contact which makes all the difference in learning and mastery. Small is good! Come join the R&R Charters and Sail School family! "But I don’t have access to radar; why should I learn that?" Interesting question! Perhaps the best answer is – knowledge is power. I learned radar years before I ever had the opportunity to use a radar unit, and it wasn’t even on my boat, but on a delivery boat. Of course on our new Beneteau Oceanis 41, At Last, I have a great unit on board. Boy, were we ever happy to have that last November during our last ASA 106 class when we spent half the time sailing in thick fog and limited visibility. We passed boats within less than 1/8 nm and never saw them! That is, with our eyes, but wow! did they ever stand out on the radar screen. During our ASA 120 class the students learn many things. Most people think of radar as a piece of equipment used to avoid collision in fog or darkness, and of course that is one very important use for it. However, there are several other great applications for radar. It is always important to know where you are on the water! Use the radar to pilot through a narrow channel, find a harbor entrance, or while anchoring, radar can help to determine a safe location, and set an anchor watch on the unit. There are so many other practical uses for radar! Check your schedule and register now for our March radar class. There are a few spaces available. First, R&R Charters and Sail School wishes everyone a very happy and healthy New Year! Penny and I enjoyed a great vacation, spending time with our daughters, their husbands, and the grandchildren. Like all grandparents, we take special efforts to spoil the grandchildren in every way possible. And now the big news! With the beginning of 2016, R&R Charters and Sail School is celebrating our 10th anniversary! It’s hard to believe that 10 years have flown by so quickly. 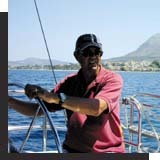 Initially we were hoping R&R would provide us an opportunity to enjoy sailing and share our passion with other people. Thanks to all our great students and clients, R&R Charters and Sail School has grown from a small two person, two boat operation to our current level. Penny and I have three vessels for sailing instruction and charters – a Cal 22 Amici, our Hunter 28 Moondance, and our Beneteau Oceanis 41 At Last. There are now four instructors involved with our school, plus several captains who are available for crewed charters as well. We here at R&R Charters and Sail School are looking forward to great 2016 season. Come join us and help celebrate our 10 year anniversary. During the colder, winter weather, we offer students an opportunity to continue learning through our classroom courses. Last month I wrote about the ASA 107 Celestial Navigation; there are still openings in these classes. Well, this month, I want to tell everyone somethings about the ASA 105 Coastal Navigation course. This is one of my favorite courses to teach! Not only is it fun, but it also gives the students very useful information and skills which they can use every day they are on the water. We begin with learning the basic method of plotting a course from point A to point B. In this process, the students learn about compass variation and compass deviation in order to plot a true course and then convert that to a compass course. Once the students have learned to plot these simple courses, it is time to learn about the effects of wind and current, and how to calculate the needed corrections for these effects. Of course, sailors will want to know where they are located on the water, so we teach the concepts of bearings in order to establish the fix. Naturally, I have heard from many students that they really don’t need to understand any of this since they have all the electronic equipment on board. So we also discuss how important these basic coastal navigation skills are even in the modern world of electronics. One other important topic is tides and tidal currents. It is crucial to be able to calculate the tide times and heights along with the current times, speeds, and directions in order to make a safe passage. 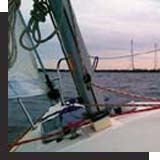 Even if you only sail on the Chesapeake Bay, the tidal current speeds can have a major effect upon your sailing time. So if you haven’t taken the ASA 105 course, check R&R Charters and Sail School’s class schedule and register for the Coastal Navigation class. There are still spaces available in these courses. And of course, while you are on the website, check out the sailing classes for 2016. I have had students sign up for classes already! R&R Charters and Sail School is looking forward to the 2016 season, and our year-long anniversary celebration! Come sailing with us and share in our adventures. It’s already been 10 years of FUN! We’ve treasured every minute. THANK YOU! Got the winter blahs? 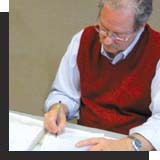 Check out R&R’s winter schedule, and go to the web to register now! Learn how to get out of your own way.....and where you are once you get there! Everyone in my family calls me Clark! I‘ve always loved decorating our house for the holiday season, and I guess at times I can overdo it. I love the beautiful colored lights, the candles in the windows, decorated Christmas trees in the living room, wreaths on the doors. But best of all is spending time with family and friends. When we purchased our home in Tunkhannock, we decided to make a special Christmas day dinner – prime rib roast, mashed potatoes with heavy cream, cream cheese, and toasted almonds, fresh steamed green beans, and molded cauliflower and red pepper platter. For dessert, it was Penny’s great grandmother’s baked chocolate date pudding. Of course, none of these had any calories, right? This has now become the family traditional Christmas meal. Even our daughters make this for their Christmas meal. What are some of your holiday traditions? Email me – I would love to share them. Many students ask me why someone would want to learn celestial navigation. From ancient times, mankind has used the stars, planets, sun, and moon for navigating both on land and on the water. Historically, sailors learned early how to determine latitude using the heavenly bodies. Even without reducing a Polaris sextant sight, the sailor can determine latitude within about 1° (less than 60nm). But, to determine longitude, one needs a dependable chronometer. The British government actually offered a monetary reward for the first person to develop a dependable chronometer for use on board a ship. For anyone who loves history, learning celestial navigation can be very rewarding. For me, I find personal satisfaction when I take sextant sights, reduce them, and plot the LOPs to find my fix. I just find celestial navigation fun! Sometimes I just want to relax, so I get out one of my celestial problem books and work a few questions. Yes, even my wife thinks I’m a bit strange, but hey, I like it! So consider challenging yourself and register now for one of R&R Charters and Sail School’s scheduled classroom celestial navigation sessions this winter. And just maybe you too will join this exclusive group of globetrotting celestial navigators! R&R Charters and Sail School thanks each and every one of you for helping make the 2015 season special and successful! We look forward to sailing with you all again in 2016. Captains Penny, Rich, Jerry and I wish you a very merry holiday season. THANK YOU! Check out R&R’s winter schedule, go to the web to register now! Any one would make a wonderful gift, and a perfect cure for the winter blahs! ASA 105 Coastal Navigation class gives the student all the knowledge and skills to plot and navigate anywhere he or she might wish to explore. 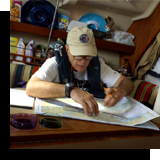 We begin with some basic concepts such as magnetic and compass errors, and corrections, and plotting a basic dead reckoning course. This course is the basis of all navigation. From these basic concepts / skills we move to taking bearings, plotting our visual fix, calculating set and drift of currents and making corrections for this, then discussing times, heights, and speeds of tides and currents from the yearly almanac, and many other topics. I personally love doing the navigation to and from new and different locations! ASA 107 Celestial Navigation class is one of my favorite classes. In this class you’ll learn about the sextant, and actually take some sun shots during our class time. I will teach you how to correct your sextant shots of the sun, moon, planets, and stars – then, using the sight reduction tables, plot the sextant shot to a line of position. In addition, you’ll learn to use a star finder, establish latitude and longitude from a noon sun shot, and how to use Polaris to establish the latitude. Using the sight reduction tables, we limit all math to simple addition, subtraction, multiplication, and division, rather than complicated trigonometry problems! Apprehensive of “complex” problems at this level? We offer an at-home study course (ASA 117 Basic Celestial Navigation) to introduce some simple sun and Polaris reductions. If you choose this option, I’m sure you’ll want to take the full 107 course! Finally, two very specific courses – ASA 119 Marine Weather and ASA 120 Radar. During the weather class, we study various weather phenomena using many great internet weather sites to find forecasts and maps. This is very in depth, and you’ll be better prepared to understand weather and its effect upon a sailboat. ASA 120 introduces the basic use of radar. Learn to use radar not only for target identification, but also for piloting and navigation. Both of these courses are filled with great information which helps the student understand what is happening around the boat, making the experience on the water safer and more pleasant for crew and guests. Check out R&R’s winter class schedule for the classes below, and go to the website to register now! Any one of them would make a wonderful gift, and a perfect cure for the winter blahs! It’s Annapolis Boat Show Time! I love the Boat Show! Naturally, the biggest draw of the show is the boats, and there’ll be plenty of new ones to go aboard and explore. It surprises me the first place everyone wants to go on the boats is down into the cabin. Really? I thought they were sailing boats. Isn’t all that topsides? Very few visitors walk around the deck. It seems they're more interested in the comfy berths, saloon seating, galley, and head, than in the actual sailboat. Though Penny and I have our new Beneteau Oceanis 41, we still enjoy looking at the boats, especially the Hylas. There are so many wonderful new ideas.....Why not dream? So, make your plans and join us at the Boat Show! Maybe you can do a bit of early Christmas shopping. I hear it’ll be on December 25 this year! Had the diver meant he’d fix it sometime today, tomorrow or next week? We waited, feeling like idiots. Before long, a pick-up truck backed in, and out jumped the diver himself. Still annoyed and with only a few words of acknowledgement to us, he began to pull on his gear. He asked Damian for a knife and jumped into the water. Seconds later, our prop was free! The diver charged $100 and asked we not tell anybody that he was a diver. We stood there in utter shock as he pulled off his suit and drove away. We wasted no time getting the engine started, and set out for a second time that day. It was mid-afternoon, and we’d be cutting it close with daylight. We were new at the helm, unsure of whether our GPS worked, and really had no idea where we were going! The bay was choppy and full of white caps which splashed over the bow as the boat crashed over swell after swell. We never found Windmill Point, we had headed too far south, so we pointed our boat in the next intended direction, keeping a better eye on the compass. The needle flopped back and forth wildly as the ice-cold sea spray stung our cheeks. But we were headed northeast and determined to arrive in Tangier before dark. There are just so many activities and things to see. Take a little time to attend some seminars. There are many interesting topics – places to visit, how-to lectures. Check out the schedule online. 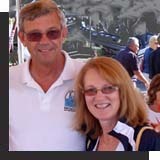 Last year, Penny and I attended an interesting one about cruising on the French canal system. Then of course, there are all the vendors in the tents and along the shoreline. You can find anything you may want to add to your boat, new equipment, electronics, or maybe just a pretty doodad. Be sure to stop by the American Sailing Association booth and say hi to Brenda from the home office. Maybe it's time to plan a bareboat charter! 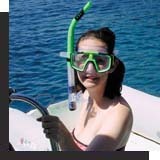 Drop by the Moorings / SunSail booth to see Jennifer, and book your cruise in the BVI, Med, South Pacific, etc. Penny and I’ll be booking a charter for next year heading back to the Greek Ionian. While visiting the show, you'll want to have a bite to eat. We enjoy dining on the terrace at the Marriott where they have yummy quick food and great bands! 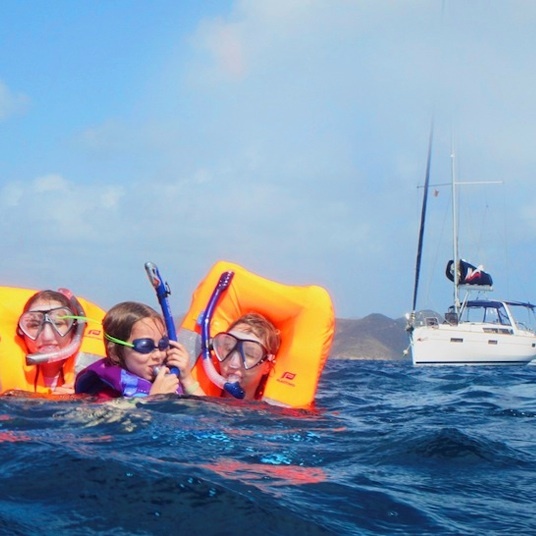 In one of my past issues I shared with you Serge and family’s first bareboat adventure in BVI. This month, I will begin sharing Hannah and Damian’s adventurous journey north with their recently purchased sailboat, Gem&I. Enjoy! 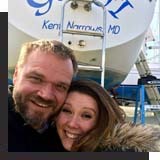 New, green, naïve, but eager to start life with a sailboat, Damian and I began looking for a starter boat immediately following the Annapolis Boat Show in October 2014. We had learned to sail the summer before from R&R Sail School at Mears Point Marina in Grasonville, MD. 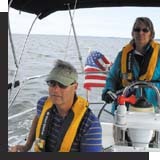 Unlike most sailing classes, Captains Dave and Penny Renoll, offered to let us stay aboard their Hunter 28 at the marina while we took the class. For me, “living on the sailboat” enabled me to truly experience what it was like to live the “sailing life” and Damian was enamored with the sights, sounds, and smells. After taking the 101class, I emailed Captain Dave to find out the availability of his Cal 22 for the remainder of the summer, so we could take her out and practice our sailing skills. We took the 103 Coastal Cruising class, and combed the Internet for sailboats. We put away money each week to afford a decent sailing vessel of our own. Our story truly began on January 3, 2015 when we drove to Deltaville, VA to make an offer on a 1986 Catalina 30 at a much lower price than was being asked. The next day to our surprise, Damian received a call from the broker that our offer had been accepted! But, we lived four hours away! Our dreams of fixing up our newly purchased sailboat were destroyed when the March snows set in, preventing us from doing anything until it melted. Since we are both teachers, our time to get Gem&I to her new slip at Mears was limited to spring break. Every weekend before that counted! We took the 105 Coastal Navigation class in snowy March at R&R, and Damian and Captain Dave used our Chesapeake Bay charts to plan out our route for sailing Gem&I from Deltaville to Kent Narrows. Then we had the issue of actually making it official that we owned our boat, so Damian and Captain Dave went off to Annapolis to register the boat and complete the paperwork but ran into a major problem. We were in desperate need of the "Abstract of Title", and the only way to get it was at Coast Guard headquarters in Falling Waters, WV. I took a day off to drive out there, ready for the beaucratic run-around, yet luckily I got the title without a hitch! October is always the Annapolis Sailboat Show. This year it runs from Oct 8 – 12. As always, there will be something for everyone – new boats, lots of marine merchandise, sailing seminars, and great food and music. Be sure to reserve the dates, and watch for more in my next issue. Florida Bound! – R&R Charters and Sail School is planning to head south for the winter! Join us on the trip down the ICW and coastwise to the St. Augustine area. Based on interest, you can complete the ASA 104 or 106 during our trip south. Or enjoy a winter getaway from the cold up north. Come join us aboard At Last. You can take a class, or just relax on a chartered cruise. Use At Last as your hotel, to visit historic St. Augustine or enjoy a Disney day. Sounds silly, doesn’t it? But seriously, I love August. Yes, the days can be really hot and humid, but ahh, those nights! 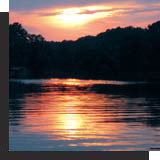 With the setting sun, the temperatures quickly drop, and it’s comfortable sleeping as the boat gently rocks at anchor. Some of my most enjoyable sails have been during August. To me, it seems this month is the beginning of the weather pattern change. Yes, there are days without any wind, but unlike July, I’ve rarely had more than one calm day in a row. Because many people are under the misconception that August is so terrible, the Bay has fewer boaters out on the water during the busy weekends. We August sailors can better enjoy the sparkling sunshine on the warm waters of the Bay. Of course, there is one bad thing about this month – the Bay waters are invaded by those troublesome nettles (aka jellyfish), making it difficult to find locations for a relaxing swim. So here is the secret to this problem. Find a quiet cove far enough up one of the pleasant rivers or creeks on the Eastern Shore where the water is too fresh for those nasty creatures to live! At this time, one of my favorite little spots is Lovely Cove, located far up Langford Creek off the Chester River . And it is lovely! Lots of birds and marine life, only a few scattered weekend or vacation homes along the shoreline, and NO nettles! So, before the kids head back to school, think about heading out on the water for a sail class or charter with R&R Charters and Sail School. And, you can bet Penny and I will be taking every opportunity to enjoy a beautiful day sail or overnight anchorage! Come join us! Last month, Penny and I did a quick sail to St. Michaels for a bit of relaxation. I know I mentioned the great restaurants that are found in this quiet Eastern Shore town earlier this season. But I just have to tell you about this one again. Mike and Eric’s is located along Carpenter Street. It is a relatively new restaurant. The sign in their window states; “Casual Gourmet Dining”. And I must confirm; it is casual and gourmet dining. 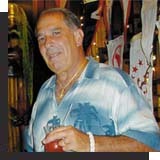 As you enter, you will most likely be greeted by Mike, one of the co-owners of the restaurant. He will take time to have a pleasant conversation with you as your service person takes your drink order and reviews the daily specials with you. Over the bar Mike usually has old black and white movies playing on the huge flat screen TV. The bar was built by the boat artisans at the Maritime Museum and is absolutely beautiful! 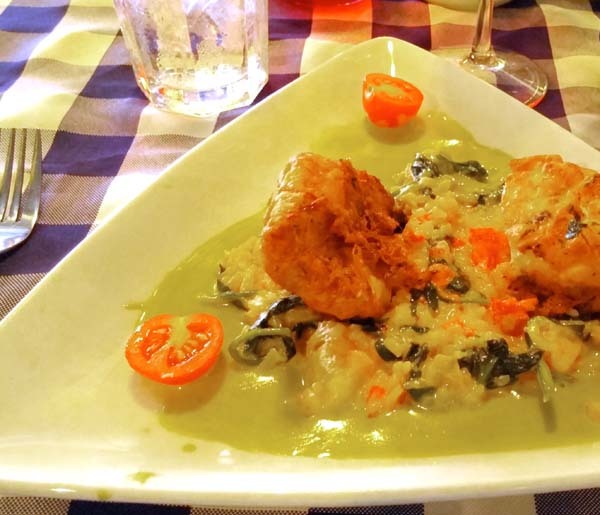 During our visit this time we enjoyed the house specialty appetizer, crab and corn fritters. Yum! Penny ordered chicken franchais and I had the special of the night, pan seared rockfish with pineapple salsa. The meals were delicious and truly gourmet. We felt very lucky that night because Eric, the chief, actually popped out of the kitchen for a few seconds! I think Eric could work in any of the top restaurants in any of the major cities around the world. But we are thankful that Mike, originally from St. Michaels, and Eric chose to open their restaurant here in St. Michaels on the Eastern Shore. So, the next time you cruise to St. Michaels, take the time to stop in and enjoy a great meal! This month, I’m sharing an article written by one of my students! 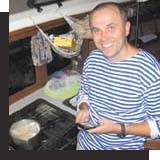 A few years ago, Serge Joukov registered for an ASA 101 class – the sailing “bug” had bitten him hard. He came back again and again for charters and additional classes. Then his wife, Julia, showed up for ASA 101 with Capt. Penny. This past October, the family came to the Annapolis Boat Show and signed up with Moorings for a bareboat charter in the BVI’s! I remember him calling me from the tent, excitedly shouting over the phone, “We did it! We are sailing the BVI!” I guess our “sailing children” are growing up. It’s exciting and rewarding to see our students progress through classes and charters here, then leave “the nest” and venture off into the world. If any of you have taken these steps and would like to write a short article to share, drop me an email. We’d love to share your experiences with other students. Just like any parent, we are raising our “children” to fly away on their own. Enjoy reading about Serge’s BVI adventure! A week after our first BVI sailing trip, we’re going through the pile of photos, recalling wonderful memories. The family has declared the trip a success – the best time we’ve had in the Carribean. There were some doubts about this vacation, despite assurance from our mentor, Capt. David, who insisted we were ready. 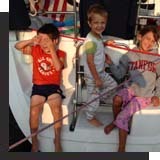 Other folks questioned if we truly knew what we were doing, going with our kids on a 7 day long sailing trip. But we pulled through. The crew included our daughters 21 and 9, my wife Julia, and me. The sailing conditions were awesome, except for the very first day which had 20kts wind. Conveniently, we took the Moorings offer of a free 4 hour training with a friendly skipper who put our minds at ease and gave us some good pointers on the sail plan. We set the second reef on the main, with a full jib, and had a nice 7.5 kts sail. The rest of the days, the wind was around 12-15kts, which provided for great sailing without the need of reefing. We had to adjust our route a few times, for example, when we arrived to Cooper Island and found all the moorings had been taken. Otherwise, none of the places we stopped at were crowded, and we never had a problem dining ashore. During our trip we visited Norman Island, The Indians, Trelis Bay, Cooper Island, The Baths, Bitter End, The Dogs, Marina Cay, Salt Island and Peter Island. We left a few other great spots for our future visit which we would like to do some day. The main lesson we learned from this trip is that everyone should participate and be involved. There was great bond within the family and it definitely prepared us for our next sailing adventure! One of the Eastern Shore’s favorite destinations is the town of St. Michaels. It’s a short 3-hour sail due south of our marina. In the War of 1812, St. Michaels actively provided many small “warships” for the young American government. The British navy naturally was not thrilled with this, and decided to attack the town with their large, slow sailing frigates. Needless to say, the citizens quickly learned the warships were approaching, but would not arrive until after nightfall. The people decided to hang their lanterns high in the tree branches to fool the British. And it worked! The only damage was to one house in which a cannonball entered the attic and bounced down the steps. You can see the “Cannonball House” located on St. Mary’s Square in town. The homes in St. Michaels are all beautiful early colonial style with comfortable front porches. Several large ones have been turned into bed and breakfasts, but most are still private residences. Along Main Street are numerous small shops with antiques, clothing, jewelry, furniture.....truly a shopper’s paradise. Sprinkled among the shops are some great restaurants serving up local seafood. One of the new ones is Blackthorn’s Pub, a wonderful Irish restaurant. I love the Shepard’s pie! Across the street is another rather recent addition, Mike & Eric’s Front Street Restaurant. If you enjoy good home cooking served in a beautifully maintained dining room and bar, this is the place. Delicious chicken parmesan! Of course the time honored restaurants are still there: The Crab Claw, St. Michaels Steak and Crab House, Carpenter Street Saloon. Be sure to tour the Maritime Museum. My favorite is the oyster building. Explore the old skipjack, and get an idea how watermen worked on the bay. Children love walking through the Hooper Strait Lighthouse with its 1800’s display showing how the keepers lived while on duty. Don’t miss the crab pot – just maybe there will be a crab or two in it! A visit during the July 4th weekend is a special reward in itself. The small towns along the Eastern Shore have some of the best fireworks displays. If you haven’t sailed to St. Michaels, you definitely need to add it to your list this sailing season. 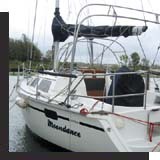 If you have completed your ASA 104, you can book Moondance for a great day sail or long weekend overnighter. Or maybe you just want to take a sail on board At Last. Either way, give R&R Charters and Sail School a call and we will make it happen for you! It’s Sunday morning and time to think about heading back to the marina. But first, let’s have a bite to eat. After a great happy hour Saturday evening and a super great grilled meal, there are always some leftovers hanging around. Nothing goes to waste on a boat. We take all those bits and pieces and make a delicious omelet, one that is a bit different every time. I lovingly call this, “Garbage Omelet”. Yes, I know, it doesn’t sound delicious but I am using all those little pieces of leftovers which would just end up in the garbage otherwise. I use 2 eggs per person, and any leftover cheese, meats and veggies. Heat a little olive oil in a pan, and add the beaten eggs. 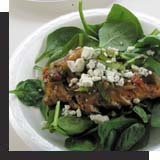 As they begin to set, add your leftovers, cover with a lid and finish cooking. Serve along with a nice toasted bagel with butter and jam. Sit down in the cockpit with a hot cup of coffee and watch the bald eagles circle overhead. Ah! Life is good on the water! You can make this at home as well, but don’t expect the same ambiance! Father's Day is Coming – So is the 28th annual Antique and Classic Boat Festival in St. Michael’s. What a great weekend for dad.....book Moondance for the weekend and enjoy it all. 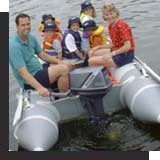 Boats range from runabouts to yachts, race boats, work boats, and hydroplanes. There’ll be a flea market, seminars, building demonstrations, music, grilled food and a “Pyrat Rum Bar”. What more could dad want? We had a fantastic April! 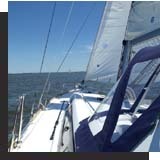 In between the cold and rainy days, Penny and I had some great sails with all three boats on the Chester River. Amici, Moondance, and At Last are eager for their upcoming season. I have completed most of my repair and maintenance lists – for now. As usual, I will be adding things onto the lists almost as fast I remove them. You do have to sail some time during the day! In addition to completing my springtime commissioning and repair jobs, I just finished up an American Sailing Association Instruction Qualification Clinic. Wow! 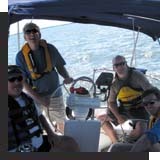 I worked with six instructor candidates, and most of them achieved more than one certification – from the Basic Keelboat 101 through Coastal Navigation 105. Some of our best sailing was for the Bareboat Cruising certification. If you weren’t out there, you missed it! Great winds 15-20kt out of the northwest and sunny! During the six hours we were out, we sailed over 30nm. The candidates demonstrated their sailing skills by tacking, jibing, points of sail, sailing a steady course, MOB both the figure 8 and quick stop, taking bearings for a fix, anchoring, docking, etc. It was absolutely the best sail since last October! Even though the candidates were being evaluated, they were all smiles, and really didn’t want to stop. Unfortunately, they had to take their written exam. Yes, even instructors must demonstrate their skills and write their tests. With the new season, I've decided to begin a new series of small articles. Many students and friends wonder what we eat while aboard our boats, especially for extended periods of time. 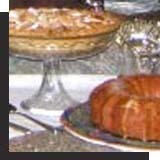 So I thought you might be interested in some of our favorite recipes. Here is one of our normal Saturday evening meals. We usually place the chicken and asparagus in a large plastgic bag in the morning and allow everything to just soak up the favors in the refrig. After anchoring and before sitting back to relax in the cockpit for happy hour, we prepare the sweet corn. This gives us plenty of time to socialize with our friends. When we're ready for dinner, we mount the grill on the stern pulpit, light it up, and place our fresh food on the hot grill. In no time, we have a great dinner! Don’t forget the tablecloth and candle in the cockpit. Sit back, relax, dig in, and watch the moon rise. Special Note – The Kent Narrows drawbridge will be in the open position for the next month and a half to two months while the Maryland Highway Department has the bridge repainted. This is good news for boats; no more waiting for the bridge to open (at least for a couple of months). Not so good for car traffic. You will need to use US 50 to cross the Narrows by car. Dream Big – As the new season begins, more and more students and new clients are registering for classes, as they take steps to make their dreams come true. 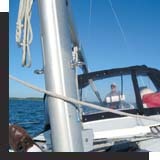 R&R Charters and Sail School is here to provide you with the tools. Register today! The 2015 sailing season has finally arrived! At Last, Moondance, and Amici are all set for the season, but I still have a few small outdoor jobs to complete. I haven’t seen many of my sailing buddies show up on O-Dock; it seems weekends arrive with the colder weather. Too bad! I get most of my work done during the week. My students, Damian and Hannah, are now proud owners of their own Catalina 30 which will be on O-Dock. 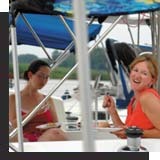 It’s great to have new people join the fun on the dock, especially when they learned from R&R Charters and Sail School. I always expect several text messages over the weekend as they prepare their boat for the journey north from Deltaville, VA. Just a couple of weeks ago I helped them plot out their route including some overnight stops along the way – Tangier, Solomons Island, and the Choptank. Two other students, Jake and Jill, arrived from Colorado in search of a boat. They’re now proud owners of an Island Packet 30. Though honorary members of O-Dock, they plan to keep it in Rock Hall for a while to prepare for their new adventures. They intend to head south in the fall for a shakedown cruise before heading across the North Atlantic! Our good friend, Jeff aboard Rising Tide, has rejoined our O-Dock family from his seasons on the western shore. We missed him. Welcome home! Our other friends, Gene and Barb, will finally get their boat Seawoof back in the water after three long years. They plan to head north to New England. 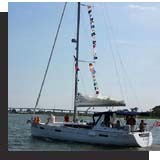 Hopefully we can manage to meet for a fun evening as they head up the Chesapeake on the way to Block Island. Unfortunately, friends, Terry and Susan will be absent this season for a year-long refit for Cloud Nine. We’ll all miss them, but there will be a spot for them in 2016. 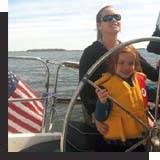 Penny and I have lots of sail classes scheduled for the season along with some day charters. Later we’ll make a quick trip to the Med and meet up with our Aussie friends, Terry and Carol, who’ve spent 3 years cruising there since departing from Mears Point Marina. We also plan to do lots of short sails when we have a day or two free. What are your plans for the 2015 sailing season? Let R&R Charters and Sail School help you to make your dreams become a reality like Damian and Hannah, Jake and Jill, Terry and Carol, and many others. Give us a call or drop us an email today and start living our dream. All last season one of Moondance’s secondary winches was not functioning correctly. I attempted to service it several times, and noticed one of the internal parts was broken. No problem, order a new part, right? Wrong! Barient is no longer in business. For an entire year I searched the internet and second-hand marine parts stores for a replacement part to no avail. So I purchased a new winch to replace the broken one. This is not a difficult job for a do-it-yourselfer, but you’ll need to disassemble the old winch in order to gain access to the internal bolts mounting the winch to the cabin top. With luck, the bolt holes will line up. Any bets out there? Fill the old holes with epoxy, and drill holes for the new winch’s mounting bolts. Be sure to use a good sealant around those new bolt holes; you don't want any water penetrating the cabin top and seeping inside. The whole job should take less than a day! It seems like this has been a long winter, but in reality, winter has passed by quickly. It seems only like yesterday that I was winterizing the boats, and now I am beginning to commission the systems and by the end of the month all three will have been out for their first romp of the season. I've said before that I am always surprised at what the winter gremlins do to the various parts of the boats. It seems that things which were perfect at the end of the season, suddenly have developed little problems. Just because it has been cold and snowy up here in the north, doesn’t mean there haven’t been opportunities for me to do a bit of sailing. Last month I worked at the Miami Boat Show, though the temperatures were a bit chilly for the area, highs in the low 70”s and lows in the mid 50’s. It was most definitely warmer than back home. My family and friends were not sympathetic that I had to be away from home. While at the boat show I took over 50 people out on the Beneteau ASA First 22 training boat for a short training sail. For me it’s very rewarding to see the big smiles as people experience a first time on a sailboat. I also had time to reconnect with old friends and former sail instructor candidates whom I had certified for their instructor status. Even though all of us worked long hours, we still found time to relax and chat about our experiences on the water. Naturally, I did take some time to visit the Beneteau boats. I hopped aboard the Beneteau 60, the first time one has been in the US. Wow! 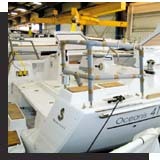 I even suggested that I would be willing to trade my new Beneteau Oceanis 41 even up for it. For some reason or other Beneteau wasn't too interested in my offer. For those of you who attend the Annapolis show, be sure to take the time to visit the 60; you won’t want to leave. Just saying! In the middle of February I will be travelling to Miami to assist ASA at the annual Miami Boat Show which runs from February 12 – 16. I have not had the opportunity to visit this show so it will be a new experience for me, though I’m not sure how much of the show I will see since I’ll be working full time! People just don’t understand how difficult it is to have to be out on the water on a boat all the time – And, yes, I can hear all the violins playing in the background! 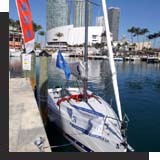 If you have time though, come on down to Miami and enjoy a great boat show in the warm weather. And of course, be sure to stop by the ASA booth! When I finally landed at BWI on my return, I was in shock. I had left the warm 70 ‘s only to arrive in a snow storm (I believe 6-8’) and freezing temperatures (low single digits). It made me want to return to Miami......but then my boats are here, waiting for me to wake them up from their winter’s nap. After I have all the systems commissioned, it’s time to give each of the boats their annual spring bath. You would be surprised at how dirty they become just sitting in their slips for a couple of months! I usually have to haul water for this first bath because I can’t wait for the marina to turn on the water to the docks. I want to be out sailing and enjoying the great spring weather. I‘ll use lots of good clean soap and water, and scrub every inch above deck. Then it’s time to launch the dinghy and scrub the hull from the deck down to the waterline, and finish off with a good coat of wax. In all, it’s a real good upper body work-out! By the time you arrive for your class or charter, the boats will be spick and span! When will I see YOU this season? While most people think of a countdown to spring with the number of days until the calendar “spring”, I have a countdown of winter jobs to spring sailing. So here goes. First, I still have several Coastal Navigation students to finish up for the winter sessions. Last weekend was a tough one; for the first time I had a class disrupted by winter weather. I have been teaching some type of weekend class sessions for the past 20 years or so, and this was a first for me. Now, naturally during the sailing season I have had to rearrange some of the sailing activities due to strong winds and foul weather, like hurricane winds and torrential downpours. But when people have to drive on snow covered roads, it really does become a serious matter of personal safety. The adverse summer weather is actually easier to deal with. We can stay at anchor for an extra day, spend the day in the slip doing all the necessary book work, etc. By the warm sailing weather, I will have everyone caught up and certified, plus have taught my annual celestial navigation class. Then, there are those winter boat jobs I mentioned before. I have several near completion, and by the end of this month most of the others should be farther along as well. That leaves me the first couple of weeks in March to begin the commissioning process. The first job will be to haul several hundred gallons of fresh water to flush the on board fresh water systems, and then top off the tanks. Then, commission the other interior systems – heat exchangers, refrigeration, engines, etc. After that, I can move on to the exterior jobs – install the cockpit canvas, hoist sails, take my spring trip up the masts, etc. That’s when the fun can begin! On that first warm, sunny day, I will just have to take each of the boats out for their shake-down cruise. I am still amazed at what the winter gremlins can do to systems which were prefect in the fall. By the beginning of April, Penny and I will be out enjoying some great spring sailing with our O-Dock friends. Of course Penny and I have a couple of personal activities planned in our spring countdown. This weekend we will be spending some time in New York City enjoying some of the great performances, and eating at a couple of our favorite NYC restaurants. While there, we’ll be meeting up with one of my high school students, who is a public school teacher in Harlem – she does have such very interesting stories to tell. And of course, we do have to spoil some grandchildren along the way! Let the countdown continue! 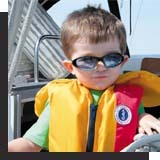 Be sure to check out R&R Charters and Sail School’s class schedule and book your class now. Spaces are filling up! Don’t be left on shore when the warm weather strikes! Here’s another DIY job, and one of the last I need to complete on Moondance before spring. She’s a 1990 boat so after all the years of sailing, the sealant around the ports needs to be replaced. Not a difficult job! Remove the fasteners connecting the interior and exterior sections and carefully break the bond of sealant. I use a product designed to dissolve it and a plastic putty knife to work around the frame. Clean off any old sealant using acetone. Failure to remove all the old sealant means you’ll be redoing this job again – take your time! Once it’s truly clean, you’re ready to re-bed it. Place 2 small beads of sealant around the portlight frame – one toward the inner edge, another around the outer edge. Carefully, attach the two sections of the portlight together with the fasteners and tighten them firmly, but not too tightly. Cleanup any sealant which has squeezed out around the frame. Allow everything to set for 24 hours before making the fasteners perfectly tight. After the busy holiday season, many people can feel depressed thinking there are several more months of cold weather before the warm spring breezes and spring rain clear away the dreary, gray winter sky. For me, these months pass by almost too quickly. Besides teaching some great ASA classroom sessions, like Coastal Navigation, Marine Weather, Radar, and Celestial Navigation, I schedule boat projects I hope to complete before warm weather. This January, I plan to install a salt water anchor washdown on At Last, which will be a big improvement over the good old bucket washdown. I only have a few more small parts to purchase before I begin. I also will switch the marine head flushing system to a fresh water one, rather than the usual salt water flush. As we all know, salt water contains numerous small critters which just love life in a holding tank where they will cause that wonderful odiferous head smell. Last season we used only fresh water for flushing, but had to use the shower heads for our water supply. I have several projects planned for Moondance. Last year I replaced her VHF radio, and now need to run the wiring to the cockpit so I can connect a remote mic. The mic will make life much easier when trying to contact the drawbridge or other boats. I must repair or replace the ship’s compass which has developed an air bubble. And, I will need to reseal the starboard ports, which will have to wait for some warm days in late February and early March. To install an anchor washdown pump you need to have appropriate parts – a specially designed salt water pump from a good marine supply house. I use vendors such as West Marine, Landfall Navigation, or Defender. All three have online catalogues and shipping. The hose connectors and most importantly, a salt water strainer should be included with the pump. Salt water contains debris which you don’t want in your pump. Purchase quality grade water hose. Don’t attempt to use garden hose! Marine water hose is designed to handle salt water and not degrade. Use stainless steel hose clamps (doubled below the water line of course). This hose needs to be connected to a below water through hull. It is possible to use a “T” off another through hull such as a head. The pump needs an electrical connection. You’ll need a 20 amp fuse, a designated switch, and proper gauge wire. Never use house wire on your boat! 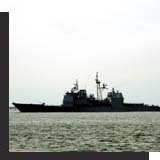 Marine electrical wire is designed with a twist to eliminate magnetic influence on the ship’s compass. This is not a difficult job for a boater to attempt, but be sure to study up on marine electrical systems ahead of time. When you’re done, you can take pride in your skills! What’s the perfect cure for the “Winter Blues”? Get ready for Spring! What is YOUR dream? What can we do to help you on your way? R&R Charters and Sail School can help make it happen for you! This is the beginning of 2015. It’s the perfect time to get started on your next adventure. PSince Penny and I planned to spend our Thanksgiving holiday in Northeastern Pennsylvania with our eldest daughter Stephanie and her family, we had to leave a day earlier in order to escape driving into a major snow storm. I always enjoy spoiling my grandsons a bit more. 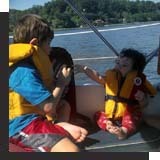 Our grandson, Aaron, is reading his book, “First Sail” and learning all the basic sailing terminology and maneuvers. Can’t believe how well he is reading! Little Collin is very busy trying to be just like big brother. Thanksgiving Day we traveled the few miles over to Penny’s sister and her family. Terry and Pat, their parents, had driven up from Lancaster a day early as well. Of course we had the traditional Thanksgiving family dinner – turkey with Penny’s mother’s special stuffing and gravy, mashed potatoes AND sweet potatoes, baked corn, Stephanie’s special green bean casserole, roasted brussels sprouts, Penny’s cranberry sauce, homemade bread, pumpkin pies, apple pies, coconut cream pie (my favorite), cookies, cakes, etc., etc. Needless to say, we did not starve! And of course the next day, the left-overs are always great – sometimes I think even better. We hope all of our sailing students had a great time with their family and friends, too. Naturally, everyone is thinking of Christmas and Chanukah. Last month, I listed a number of gift ideas. If you missed that, you can check out the November issue on our website along with all the other past issues. This time of year has always been my favorite! I love the decorations, the music, and the special time spent with family. R&R Charters and Sail School wishes all of you and your families the very best holiday season and an a very happy and healthy New Year. We look forward to sailing with you in 2015. At the beginning of November, we winterized Amici and Moondance. After taking the sails down on Amici, I took them to the sail loft for their bi-annual washing and repair along with At Last’s spinnaker. I have found that my sails last much longer by having the sail loft keep them in good repair. Now with the cold weather, I will need to winterize At Last – always a sad time. Normally I do all this type of work myself. However, since At Last is still under warranty, I want to avoid any possible arguments that I may have not done something “correctly”. This way the onus will be Annapolis Yacht Sales. I will definitely be present so I can follow along with each step. I am still learning where all the bits and pieces are located on board At Last. If you remember, we took formal possession of her at the end of June. In these few months, she has already sailed almost 700nm just on the Chesapeake Bay. My plan for the end of next year is to head south to Florida where I will continue to offer students classes, as well as opportunities to charter along the Florida coast and even to the Bahamas! Wow! I won’t need to buy all that “pink” stuff for her next season! You may remember our special Australian friends, Terry and Carol, aboard their Catalina, Common Sense. They have just completed their third season in the Med, having crossed the Atlantic with one of the European flotillas. Last spring they left their winter marina in Turkey, turning west. After a wonderful season along the Turkish, Greek, and Italy coasts, they’ll be flying back to Australia to spend the holidays with family and friends. Penny and I have plans to meet them near the French or Spanish coast next season for a bit of fun! 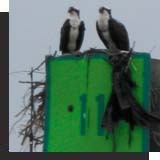 Follow their adventures at http:// sailingnavyblue.blogspot.com. The Boat Show is Over! Penny and I had a great time seeing the show through the eyes of Hannah and Damian, our newest avid sailors. The sparkle in their eyes remainded us of our first time at the show. Just like us, the two of them hopped aboard numerous boats, oohing and ahhing, dreaming of the time in the near future when they would purchase their first boat, albeit used, and become the newest members of the O-Dock clan. While at the show, Damian purchased his own set of Chesapeake and Delaware Bay charts. Yesterday as we were taking Moondance over to Annapolis for some maintenance issues, he told me how he spends hours studying the charts and dreaming of their future cruises on the Bay. Of course, the boat show wouldn’t be the boat show without enjoying the traditional pain killer on the Mariott deck. And then there was the exciting text from Serge and Julia. 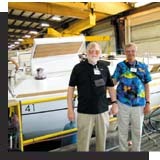 They were spending some time at the Sunsail / Mooring’s booth booking their first bareboat cruise in the BVI. Yes, all those lessons do pay off! Even their daughters were all smiles with twinkling eyes dreaming of their cruise next spring. I am sure I will be spending some time this winter sharing some ideas for their cruise – definitely must visit Josh van Dyke, Bitter End Yacht Club, the Bight, oh just so many great destinations! Maybe they should plan a two week cruise! 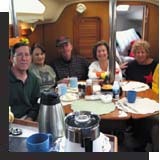 Our good friends Gene and Barb joined us Saturday morning for our annual boat show tradition – breakfast at Buddies. Surprise! Buddies decided not to serve breakfast this year! Guess they decided they didn’t need boat show money??? We always enjoyed spending a couple of hours leisurely grazing at the buffet while overlooking the show. Oh well, we just had to walk up Main Street and enjoyed a great breakfast at Café Normandie. The French really do know how to cook! Friday afternoon, after our annual American Sailing luncheon at the Chart House, Penny and I had a couple of free hours to enjoy the show for ourselves. My first stop was the Gil booth where I purchased some new foul weather gear for myself. Now I won’t be feeling the wetness soaking through to my skin in just a few hours. Instead, I’ll be able to stay dry for hours and hours and hours. Guess Penny will be able to stay below and enjoy a good book while I pilot At Last through the rain. Penny did check out her favorite booth, Zeus with all the over stock from this past years regaattas. Unfortunately, she didn’t find anything for herself – just a great jacket for our oldest son-in-law’s birthday gift. Be sure to mark your calendar for next fall’s boat show – always the Thursday before Columbus Day weekend through Monday. 2015 class schedule will be posted soon! Be sure to check it out and book your next class early. We have been extremely busy during the 2014 season. Thanks to all our great clients! 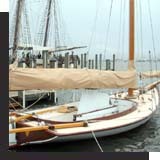 October not only brings great fall weather and sailing, but also the Annapolis Sailboat Show, October 9-13. There are always great opportunities to step aboard numerous new boats and dream, great exhibits providing every safety item and convenience you could possibly need or want, and of course great food from many vendors and all the super great restaurants in downtown Annapolis. 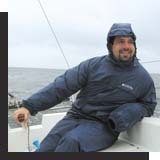 In fact, I think I will need to bite the bullet and replace my 10 year old foul weather gear – it’s only sailed about 15,000 miles through all kinds of weather from gentle rains, torrential downpours, and snow storms!. Penny and I will be spending lots of time at the show, working and enjoying the sights. We usually take Saturday just for ourselves, to visit the new boats and make our purchases from all the exhibitors and vendors. On the other days, I will be working at the American Sailing Association booth, as well as helping with their newest project – the ASA Beneteau First 22 trainer. At last year’s show, ASA’s CEO, Charlie Noble, introduced the instructors to this joint project between ASA and Beneteau. Beneteau’s project manager attended our annual luncheon, and asked for instructors’ input into this proposed new trainer. Now, at this boat show, the ASA/Beneteau First 22 will make its American debut. I will be taking instructors and school owners out for a test “drive” as well as being present at the Beneteau boat booth. I feel very honored to assist ASA and Beneteau in this endeavor. 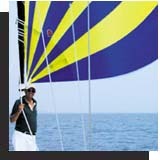 In fact, R&R Charters and Sail School will be ordering one of these trainers in just a couple of years. If you are an instructor, go to the ASA website and sign up for a test sail – there are lots of timeslots still open. The test sailboat will be sailing out of Eastport across from the harbor. Those who are not instructors can hop aboard a boat at the Beneteau booth. Be sure to stop bye the Sun Sail and Moorings tent, and speak with my good friend Jennifer Carauthers. If you have completed your ASA 104 Bareboat Cruising class, you just might want to book a bareboat cruise for yourself and take advantage of their boat show discount! Penny and I have been discussing options for our own cruise, although we haven’t made a definite decision. There are just so many great cruising grounds around the world. I personally love the Med, but, boy would I love to do some sailing in the South Pacific or Australia! Oh, and of course there is always the Caribbean….. I hope Jennifer is prepared to spend lots of time helping us make our choice for 2015. I know two of my student couples are planning their own cruise in the BVI for this coming year. It’s so great to see my little “babies” growing up and heading out on their own! R&R Charters and Sail School will help you make your dreams come true too! Wow! Our students have been actively taking advantage of these boats this season. It seems every weekend someone has been out sailing and enjoying the fresh air and beautiful water on the Eastern Shore. There have been a couple of times when all three boats were out on the water at once! There are still many more days of sailing left in the 2014 season for you to hop aboard. So give us a call or drop an email. But don’t wait too long! Dates have been filling up very quickly! RIGHT NOW is the greatest sailing of the year! The weather is clear and crisp. The wind is steady and cool. The daytime temperatures are comfortable (you may even need a sweatshirt or sweater), evenings and nights are cool and perfect for sleeping! If you have not sailed during October, now is the time. Gives us a call – it's not too late! R&R Charters and Sail School Season 2015 Class Schedule will be coming out soon! Watch the website, and make your plans for next season’s classes and charters. As a public educator I was always thrilled when my students demonstrated their excitement about learning. Now as a sail instructor, I experience the same kind of joy when I see my students out sailing and developing their skills. Let me tell you about a few of my students. Two of my very first students were students were John and Susan. They were recently married at that time, and thought it might be interesting to learn to sail. 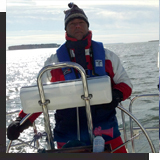 Both did very well during the ASA 101 Basic Keelboat class, and soon returned to do a bit of chartering aboard Amici to begin perfecting their skills. They both registered for the ASA 103 Basic Coastal Cruising class even though they now found it more difficult to break away for a few days because of their growing family. 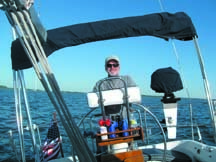 John continued his learning by taking the ASA 104 Bareboat Cruising and the ASA 105 Coastal Navigation classes while Susan spent time caring for their three young children. This past month, John and Susan, along with their daughter and two sons, took the jump forward, and did a day charter aboard Amici, and another day charter on Moondance! While checking out Facebook, I saw the happy, smiling faces of all five members of the family. Looks like more and longer cruises are in the future for them! Then there is my most recent young couple, Hannah and Damian, two young elementary educators looking for a way to relieve all the stresses from their job. Early in the 2014 season they registered for ASA 101. Being educators, they had prepared by reading the textbook and studying the material prior to their class. It didn’t take long before they were hooked! Maybe Hannah had a bit more drive to learn sailing, since her grandparents had completed a circumnavigation in the early 1970’s, and her mother had shared the log of that experience with her as she was growing up. Since their class at the beginning of the season, they have returned for 10 days of chartering Amici. On their last charter, they asked me if I thought they were ready to do the ASA 103 class. Well, yeah! It IS time to move up to Moondance! Finally, there are Josh and Christine. This young couple registered for the ASA 101 class a couple of years ago. They were hooked big time! During that same first season they completed the ASA 103 class, and by the next season were back for the ASA 104. At that point they began to charter Moondance for two and three day weekends. So why do people want to charter? Well maybe because they want to visit and sail in other places just like Josh and Christine. Last winter they headed for the BVI on their first bareboat charter there. They must have liked it, because they’re heading back to sail there again this fall, along with some friends! From Crisfield, it was time to head back north. We spent several nights anchored in the rivers along the bay, ending up in Annapolis for a couple of days so some final work could be completed on At Last. It was a great sail back from Annapolis to the marina. I think At Last was glad to be back home after her 350nm shakedown cruise. Before I know it, shell be ready for more adventures on the bay and points south! As I said at the beginning of this article, these success stories make me feel very proud. I love seeing my “little” beginners develop into competent sailors heading off on their own to enjoy their new found passion for sailing. Why don’t you come and join us? Let R&R Charters and Sail School make those dreams come true for you – just like John and Susan, Hannah and Damian, Josh and Christine. With the arrival of fall weather we all realize that the beautiful, warm, sunny weather will soon be behind us. Not many people want to go out on the water when the temperatures are in the 30’s and 40’s with a cold north wind blowing across the waves. That doesn’t mean you need to stop learning and developing your skills. R&R Charters and Sail School offers several great classroom courses to help take your mind off that dreary winter weather and make you dream about the next warm sailing season. July 11th – what a special day for Penny, our family, and me! At noon, our friends and relatives met on O-dock at slip 376. Our event began with Penny playing Etta James’s song “At Last” through our on board stereo system. Then we had a short ceremony naming our new vessel and asking for God’s blessing of the vessel and our crew. Finally, we went to the foredeck and Penny and I broke a bottle of champagne over At Last’s bow. With the ceremony completed, we all adjourned to the covered pavilion at the end of the dock. Everyone had brought a favorite dish to share. Penny and I had roasted a turkey and a pork tenderloin. Our daughter, Stephanie, made a delicious fresh salad. My sister-in-law, Wendy, had a beautiful cake to complete the celebration. I think I ate the last piece out of the freezer for dessert last night. I can’t remember what all the dishes were, but everything was great! Thanks to our O-dock friends, and family for helping make the day so special. After cleaning up, Penny and I took some of our relatives sailing out on the Chester River. We had to make 2 trips – on the first sail we had 12 people aboard, and on the second sail I believe we had 14! There’s lots of room in At Last’s cockpit! On Monday morning, Penny and I set out on a ten day cruise on the Bay. We headed south to the Choptank River and anchored in Broad Creek, where we rode out a thunderstorm. Then, continuing south, we sailed into Solomons Island and spent the night in a marina. For our next stop, we wanted to visit Tangier Island, but because the marina there did not return our phone calls, we opted to spend the night in Crisfield. If you have never been there, Crisfield was the second largest city in Maryland in the early 20th century. The oyster, crab, and fishing industry crashed, a large fire burnt most of the old town, and recently, it was devastated by some major storms. As a result, Crisfield is now a small, quaint town on the Eastern Shore almost on the Virginia border. From Crisfield, it was time to head back north. We spent several nights anchored in the rivers along the bay, ending up in Annapolis for a couple of days so some final work could be completed on At Last. It was a great sail back from Annapolis to the marina. I think At Last was glad to be back home after her 350nm shakedown cruise. Before I know it, she’ll be ready for more adventures on the bay and points south! The ASA 118 Docking Endorsement is one of the best and most important classes you can take. During this one day class, we discuss in depth the theory behind our docking procedure for a sailboat with an inboard engine. Then we spend the afternoon practicing and using the theory. Even though students learn some of this during the ASA 101, 103, and 104 class, this class brings everything together. Students, who have already completed this class are amazed at their added understanding, and their improved handling of the boat under power. Secondly, summer is hurricane season. I strongly suggest you check the National Hurricane Center on a regular basis. Here you will have the latest updates for each tropical storm and hurricane. Have you noticed the great weather we had in July? Warm days, cool nights, and great winds! I usually find July one of the hottest and most humid months on the bay, and I can’t wait for August. Most often I find August a great month for sailing. The days may be hot, but the nights are beginning to cool down for the upcoming fall weather. R&R Charters has been very busy with classes and charters this season. Don’t wait to sign up for your next class; they’ve been filling quickly this season. She’s great! Thanks to all of you who attempted to guess her name. You all had some great ideas. As most of you know, Penny is a music educator, and our family is very active in performance and education. 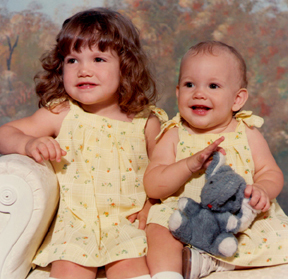 Penny and our eldest daughter, Stephanie, are professional educators and musicians. Stacie, our younger daughter, is an excellent flutist. And, I was very active and dedicated to directing all the high school musicals and theatrical productions. So, our new vessel’s name is At Last, a great classical vocal piece made famous by Etta James, not to mention the double meaning. On July 12th, we will be having the formal christening at our marina, and have invited all our great O-dock friends and family to attend. We’ll even be doing the champagne bottle over the bow; Annapolis Yacht Sales provides a special one for this purpose. After the christening, we’ll be enjoying some great food with our guests, and later in the afternoon, Penny and I plan to take our family for a short cruise aboard. At Last has three cabins and two heads, a great galley and saloon, and a very nice navigation station. On deck, I have added a chart plotter, radar, AIS, autopilot, and windlass. The new Beneteau comes equipped with a duel helm, and a wonderful swim platform which lowers providing an easy access to the water and the dinghy. Because of her special design, she sails along easily, even in light winds. Oh, I forgot to mention that she comes with an electric winch for raising the mainsail – this is Penny’s favorite piece of equipment. We can’t wait to share our newest vessel with our students. So hurry and register for your 104 or 106 class. Or maybe you would just like to hop aboard for a day charter, weekend charter, or even longer. You’ll feel like you are relaxing at home! With the beginning of summer we need to take extra care when planning our cruising and sailing time. In addition to listening to the normal TV or radio weather forecasts, I recommend you go to two great NOAA websites. Here you will find the most recent forecast for the local area where you plan to sail and cruise. You just click on the US map – for the Chesapeake Bay – that would be on Sterling, VA. Then you just click on local the area, and you will receive the best weather information for the next five days. Maybe we should have consoled some of our clients – you came up with some really good names – Encore, Crescendo...excellent choices, but sorry, not correct. I think I’ll wait till next month to reveal it, so you still have a couple of weeks to come up with the correct name prior to her christening. We don’t have a date for the big event – we’re waiting to actually have full possession of her. Interesting enough, I am already paying insurance for her! July Fourth Weekend is coming up! We’re noticing all the bunting and flags, and everything seems to be red, white, and blue! Did you put your flag out yet? Are you singing Sousa marches under your breath? I am! Fourth of July weekend is always great at the boat. We all sail to ALL of the fireworks and fun at ALL of the anchorages anywhere we can get to. The towns coordinate their fireworks to be on different days, so we sail to a different anchorage in a different town each day. The most we’ve ever attended was 5 nights…all day, we sail to the next place.... we party, laugh, and barbecue aboard, while most evenings there’s a brass band on shore playing all the favorites…….then it’s time for the BIG event……the fireworks usually go off nearly overhead....it’s truly awesome! on May 29. Prior to her safe arrival, I had nightmares of the truck becoming involved in a major traffic accident and our beautiful boat scattered in pieces across I-95. I had the opportunity to visit the factory during the first week of May. Since Penny could not take the time off from school, I invited my father-in-law, Terry Griggs to travel with me. 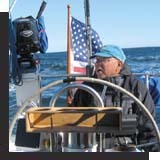 He and I spent many weekends sailing together aboard his C&C 24’. At the factory, Mike Watson met us in the office and took on us an extended tour of the factory. The only pictures we were allowed to take were of our boat. Believe me when I tell you that we took numerous pictures of our 41’. Notice I haven’t told you her name yet. The hull of each new boat is composed of four major parts – the hull, hull liner, deck, and deck liner. Each begins with gel coat sprayed into the mold, followed by applying epoxy resin and fiberglass. Each piece of fiberglass is laser cut and labeled prior to installing. From there, the hull and deck are moved onto the line where all holes are precut and deck hardware is installed. 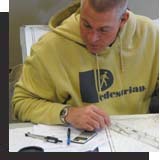 During each step, there is an extensive inspection process. As the hull moves down the line, various components are installed at each station, until the deck and hull meet and are joined together with epoxy and bolts. All interior wooden parts are computer cut at the factory, though when Beneteau began building here in the US, these components were shipped from France. I was surprised to learn that the various compartments are pre-assembled in jigs, and then placed inside the boat as a single unit. I always thought each piece was cut and placed individually. There were roughly four dozen boats on the line, and my boat was in the test pool for final quality checks. When I was allowed to step aboard, the air conditioner for the aft cabins was running. I can tell you it felt very comfortable. The 50hp Yanmar was also running! Naturally, the interior was not assembled but I could visualize how she’d look when I’d step aboard after taking formal possession. Currently, Beneteau sends out four completed boats per week, producing about 200+ boats per year. So what are our plans for the Beneteau? Penny and I plan to spend every possible day aboard, sailing and exploring the bay, and teaching sailing classes. Our daughters and their families are planning to visit, and when I sent some pictures, my grandson, Aaron said, “I’m jealousing! I want a boat like that!” Mom had to explain that he actually does have a boat like that “every time you visit Opa!” I can’t wait for him to drive her out of the slip like he did last summer when he and I had our first overnight sail alone. In addition to our personal use, we will be teaching ASA 104 and ASA 106 on board her, as well as doing captained charters. For those who have not yet taken the 104 or 106, now is the time! Or, you might want to experience a day or weekend charter! The Beneteau is here for our students to experience as well. And perhaps in the very near future, she may be heading south to Florida and the Bahamas???!!! ASA 118 (Docking) – June 23 – one of the best learning experiences for anyone who has already taken the 103 or 104. Oxford is a great sail from Mears Point Marina. Turn south just outside the marina entrance and motor through the drawbridge. Once clear of the southern end of the Narrows Channel, hoist the sails and have a great sail down Prospect Bay and the Eastern Bay to Popular Island. If the wind is perfect, you can continue sailing down Popular Island Strait channel. Otherwise, drop sails and motor in preparation for your passage through Knapp’s Narrows Channel and drawbridge. On the eastern side of this channel you can once again raise sail and enjoy a great ride up the Choptank River, made famous by James Mitchner’s novel “Chesapeake”, until you approach the Tred Avon River. Making a turn to port, you can continue your short sail up this small river; just watch out for the small ferry which crosses the river. Upon arriving at Oxford you have your choice of picking up a mooring ball off the Strand, or continuing around the corner and spending a night in one of the marinas located just inside the harbor. Or you might opt to drop anchor for just a quick trip into town and then continue up the river and enjoy a peaceful night on the hook in one of the numerous great rustic coves along the Tred Avon. In town, you’ll find some very nice restaurants for either a late lunch or early dinner. Being on the Eastern Shore, you’ll definitely want to dine on crabs, crab cakes, crab imperial – you get the idea. Naturally, you might want to try something different, perhaps filet of rockfish stuffed with crab meat or crab imperial. Sorry, I must have those Maryland crabs on my mind! While walking off some calories, be sure to take some pictures of the beautiful old homes in town. If you have young children, they’ll enjoy spending some time running in the park along the Strand or wading in the water. With luck you might even discover the small local museum which provides a glimpse into Oxford’s early history. Unlike the last three locations I discussed, your sail to Oxford and back will be an exciting 12 or more hours spent guiding your vessel through the waters. A visit to Oxford is almost like Wells’s novel The Time Machine”. So give us a call and book Moondance for a fabulous weekend of sailing and a walk back in history. Sorry to say, but no one had the correct answer to the set and drift question. If you’re planning to cross the Gulf Stream to the Bahamas, you might want to review set and drift problems, otherwise, see you in Europe? In about 10 days, I’ll be visiting the Marion, SC Beneteau Factory to see our new Oceanis 41’ near the end of the production line! Penny and I are a bit excited! So here’s the deal. Guess the name of our new boat. The winner will receive a $50 gift certificate which you can use toward any charter or sail class with R&R. You will also receive a personal invitation to our christening party! Let me give you a few hints. * Our first boat was named Sea Sharp painted on a treble staff surrounded by eighth notes. Her dinghy was named C# Minor. * When we purchased our Cal 22’, we kept her name Amici because when we were living in PA, Penny taught a children’s choir for Marywood University and the group’s name was Amici. 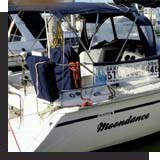 * Upon purchasing her Hunter 28’, Penny once again kept the name Moondance because she likes that song. Special note: close friends and relatives are excluded from this contest. Rock Hall is one of those small, Eastern Shore towns which has remained unchanged for the past 50 years. Originally a small waterman’s town, it now caters to the boater who wants to escape the Western Shore. From Mears Point Marina, head north into the Chester River, and continue toward the Chesapeake. Once you clear the green can 3, you easily spot the two large blue water towers. Simply keep the shoreline to starboard , but watch out for all the crab pots! Remember – it’s a waterman’s town! Before long you’ll spot the green cans 1 and 3, and as you near the red 4 buoy you’ll need to make a decision. Do you want to go into the main harbor, or do you want to sail into Swan Creek to anchor? I personally prefer Swan Creek! It’s an excellent anchorage. My friends and I with a six boat raft up, once rode out a severe thunderstorm there. No problem for us, although many other boaters found themselves dragging anchor! Maybe a 10:1 ratio might have helped? You might decide that you want to pick up one of the mooring balls here in Swan Creek or continue into one of several good marinas on the backside of Rock Hall. As I said, you’ll need to make a decision! After your short 3 hour sail, there’ll be lots of time for activities. Take a nice relaxing swim after setting out some crab pots. Remember? Waterman’s town! You might want to take a pleasant dinghy ride around the anchorage and watch for water birds, wildlife, and deer wandering along the shoreline. Or, you might decide you want to explore the town. By dinghy, you can motor into Haven Harbor and dock at the public dinghy dock. From there, you can take the free Town Trolley, or you may just want to exercise your legs and hike into town. There are several excellent restaurants – two of my favorites are Bay Wolf and Waterman’s. The first one features excellent local seafood and surprise! German food (it’s owned and operated by Austrians). I can recommend the Wiener schnitzel or Sauerbraten! During the summer their nieces and nephews come over for vacation and end up working in the restaurant. Waterman’s offers excellent crab cakes! Remember? Waterman’s town! Penny and I will sometimes take a quick sail (during the week of course) and tie up at the restaurant dock for a nice lunch. You will definitely want to take some time to explore the many small shops in the center of town, especially the ice cream shop! If you are looking for a “rocking” night life, Rock Hall would NOT be the place. Remember? Waterman’s town! Last month I mentioned St. Michaels has a very nice July 4th fireworks display. Well, Rock Hall has one of the very best small town July 4th fireworks shows set to music! Remember my raft up? It was during one of these July celebrations! We still smile and laugh whenever we remember our friend Jeff’s boys aboard Rising Tide using the air horn to show their approval of an especially beautiful firework! You too can make your own memories. 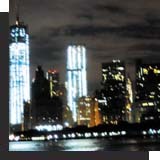 Just book Moondance for your own July 4th excursion! Here is this month’s problem still based on our previous problems: Using the correct fix and DR positions and the previous course information, calculate the set and drift. Then determine the correct PSC course to steer to arrive at our destination, the safe water buoy at the mouth of Sakonett River. Use 3ºE deviation to solve this problem. R&R Charters and Sail School has just ordered a new Beneteau Oceanis 41’ vessel to replace Zufrieden! Our order was just placed on Wednesday, March 19. She should arrive by mid-summer. More news and details later! In the meantime, Zufrieden is now available for purchase. Those of you who have sailed aboard her know how well she sails. The Hunter Legends have maintained their value and are one of the most sought after used vessels. If interested, please call R&R Charters and Sail School for more details. DR - 41o 21.6’N / 071o 20.2’W; Fix - 41o 22.43’N / 071o 21.4’W. Congratulations to Charley N. for being the first person to solve last month’s problem correctly. He won the $50 gift certificate from R&R Charters and Sail School! There were a few other individuals who had the correct solution, but unfortunately Charley beat you out! One of my all-time favorite places on the Eastern Shore is St. Michaels, the town that fooled the British. During the early years of the 1800’s many towns on the Eastern Shore constructed small, fast frigates for trading as well as for the young American Navy. St. Michaels was one of these. In the War of 1812, the British navy pretty much controlled the high seas and the Chesapeake Bay. Nevertheless the small American frigates pestered the slower, much larger British warships. As a result, the British admiral sent one of his ships up Eastern Bay and the Miles River with the task of bombarding and destroying the shipyards at St. Michaels. Once the British started up Eastern Bay, lookouts quickly rode into St. Michaels and warned the town. They realized the British would arrive after dark, so the residents hung lanterns in the treetops and kept their homes dark during the seige, hoping to confuse the attackers. As a result, the British aimed too high and overshot the town. Only one cannonball landed on a house in St. Mary’s Square now renamed the Cannonball House. From Mears Point Marina it is only a short three hour sail south through Kent Narrow’s Drawbridge, down Prospect Bay, across the top of Eastern Bay, and into the Miles River. When you arrive, there are several marinas if you choose to stay in a slip, or you can anchor in the harbor or in the river just outside the harbor. The town provides a great dinghy dock right next to the Crab Claw Restaurant and The Patriot tour boat. 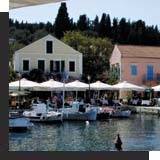 Around the harbor and in town, are numerous excellent restaurants. Two of my favorites are Carpenter Street Saloon and St. Michaels Crab & Steak House, but don’t be afraid to try others as well. The ladies will certainly enjoy the great shopping and antiquing along Talbot Street. And don’t forget to plan a visit to the Chesapeake Maritime Museum. On the grounds are terrific displays of 17, 18, 19 and early 20th century life around the bay. You can also go inside the original Hooper Strait screwpile lighthouse which the museum has restored to its 19th century appearance. If you’re planning a cruise over July 4, St. Michaels has one of the very best fireworks displays on the bay. But be prepared to anchor along with dozens and dozens of other sailors. Like other cruising destinations, the best time for a St. Michaels visit is on a weekday when most sailors are at work. During the sailing season’s weekends you must always expect large crowds of boats, so go early. Unfortunately, no one had the correct solution to last month’s problem. Let’s try another one. Remember, a correct solution will win the first person a $50 gift certificate good for any charter or class. What is your 1100 DR? What is your 1100 fix? Your deviation for your course is 3ºE and your departure time was 0945. The date is still June 1, 2013. 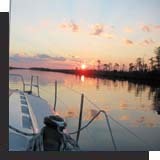 Take one of R&R Charters and Sail School’s classroom courses! the “Sailing Capital of the World”. Our marina is ideally located for just such a weekend or mid-week cruise. I personally prefer sailing there during the week rather than on a weekend since there are so many other boaters who only have time on a weekend. 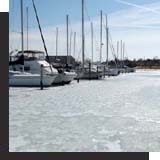 From Mears Point Marina you have two choices of route – the shortest is to head out the Chester River and turn toward the Bay Bridge. Even before you clear the bridge, you will see the three red and white radio towers on the northern point of the Severn River. On the southern shore, you will also spot the water tank – sail just a few degrees east of this water tank until you enter the mouth of the river. Give the yellow spider plenty of clearance on your starboard side as you head up the river for a few miles until you reach the seawall off the Naval Academy. For a longer sail, you might want to turn south outside the marina and head through the draw bridge. On this route, you’ll head down Prospect Bay then turn down Eastern Bay for a great sail to Bloody Point Light. Turning northwest, you should spot the three red and white radio towers on the northern point of the Severn River. Along this route you’ll pass the most beautiful lighthouse on the bay, Thomas Point Shoal Light. It is now owned by the Annapolis Historical Society which operates weekend tours out to this historic site. Either route will bring you to the historic capital of Maryland. Inside the harbor you’ll have many options to moor your vessel. You can choose to anchor in the open anchorage off the seawall, but it will be a bouncy exposed area. I prefer to pick up one of the many mooring balls just a bit further inside where there is much more protection from waves and wind. The charge is just $35 per night. If you want to impress all the tourists with your seamanship and the beauty of your vessel, you can opt for a slip in “Ego Alley”. This will be substantially more per night. 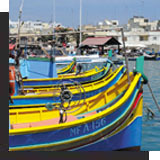 Ashore, there are many great restaurants to choose from. While in town, take time to visit the Naval Academy – bring your ID. You can visit the Chapel, Visitors Center, and Museum – at no charge. For those of you who have completed your ASA 104 Bareboat Cruising class, this is a perfect place for you to sail Moondance. In fact, she almost knows her own way there. Drop us an email to reserve your dates. To help you maintain and refresh your navigation skills, I will be posting a new problem each month during the 2014 sailing season. Please use the training chart, 1210TR, Martha’s Vineyard to Block Island for the solution. Email me your correct answer. The first correct answer will receive a $50 discount on your next class or charter this season. I will post the correct answer in the next issue of Boat Buzz. It is June 1, 2013. You are sailing at 4.5 kt toward the Sakonett River. At 0945 you find yourself located at buoy W Or “A” Fl 4 sec bell south of the river. You now adjust your course to arrive at the BW “A” Fl 3 sec buoy at the mouth of theSakonett River. What is your true course and what is your PSC course to this location. What is your ETA? Note: Your deviation for this course 3ºE. It won’t be complete until you walk up to the Maryland State House – the oldest legislative building in use in the US. Inside, you can view the current Senate and Delegates meeting rooms, as well as the original Senate room. They’re restoring the original Delegates room where General George Washington resigned his commission in the Continental Army. There are also many historic homes nearby as well as the church located in Church Circle. The homes charge a small entrance fee, but the church is free. Three of the four Maryland delegates to the Continental Congress were members of this church. After stepping aboard Shere Khan and stowing our provisions, we left the marina on the east coast of St. Martin. Clearing the inlet, we immediately began to experience 6’ ocean swells, and a strong east wind of 15-20 kt. Under a reefed main and jib, we set sail for our first overnight anchorage in St. Barts, 20 miles southeast. It wasn't long before waves were breaking over the bow as the wind began to pick up because a thunderstorm was approaching. Within minutes the waves had built to 8-9’ and heavy rain made it difficult to see the bow, but it would soon pass. It only lasted 20 minutes before the rain stopped, although the strong wind continued for the rest of the afternoon. In a few hours we arrived at our anchorage, prepared our dinghy, and headed ashore for a bit of relaxation and swimming – a great start! The next couple of days were to have 35-40 kt winds with gusts of 50 and waves 8-12’. After checking charts, we decided to sail to Marigot on St. Martin, where we could enter a marina which has a surrounding seawall. So after breakfast, we headed off for an exciting sail. The crew insisted the waves must have been at least 15’! After a fast galloping sail, we turned the point, and passed the main airport runway as two large planes came down for a landing close overhead. The island blocked the large waves, so all we had to deal with was the strong wind as we beat toward our welcome Med moor on a concrete dock. We explored the French town, Marigot. Penny and I loved the little stores and super great French restaurants! In the morning, we shopped at the local farmer’s market for some fresh fruit and spices, and enjoyed tasting the local foods. 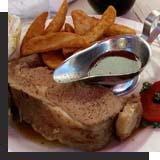 There are many restaurants, cafes, and local pubs offering some of the finest French cuisine. Next day, the storm had passed so we headed for Anquilla, a nice little British island with numerous marine parks. We had a perfect broad reach to the southwestern corner of Anquilla, and made our turn toward Road Bay. We set the anchor for the night, and I tried to take the dinghy ashore to clear us in at customs and immigration, but the dinghy engine decided it would be a good time to take a break and not start. 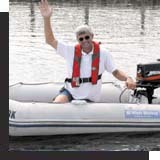 I hailed another SunSail charter person, and hitched a ride ashore while the crew worked on the dinghy engine. In the morning, after a short sail, we picked up a mooring, and went to the beach for some exploring, before heading back to the main island for our overnight anchorage. We found a wonderful little restaurant right on the beach, and consumed large portions of delicious steak and lamb chops. All too soon, it was time to head back to the SunSail Base. We stopped for a couple of hours to swim and snorkel, but by mid-afternoon it was time to turn the bow of Shere Khan toward the Oyster Pond inlet and bring her back home. Penny and I have had the opportunity to sail in many different areas of the world because of our ASA training. Still our favorite sailing location is the Ionian Sea on the west coast of Greece. We dream of returning with our daughters and their families to enjoy the area again. Make your own dreams come true. Take the ASA 104 Bareboat Cruising Class – take ASA 105 Coastal Navigation, and make your dreams a reality. R&R Charters and Sail School is ready to help you achieve your goals! All of us here at R&R Charters and Sail School hope you had a great holiday season. Although sailing is a passion for us, we have to say that spending time with family and friends is always at the top of our list. Penny and I traveled to visit our daughters in PA and MA to spoil grandchildren a bit. We hope you also had lots of time with family and friends, and wish everyone a very Happy New Year! We look forward to sailing with you in 2014! I love this time of year! It’s a time when I can relax for a bit, and enjoy spending time with family and friends. My wife often accuses of me of being the local “Clark Griswold” since I begin decorating the house immediately after Thanksgiving. Personally, I would leave my decorations up until Easter if Penny would allow me. But don’t worry, because right after the New Year, I will be forced to take everything down and pack it all away until next season. for any amount. The person can then use it toward a charter or sail class in 2014.
such as "Longitude" by Dava Sobel describes Britain’s attempt to develop a dependable chronometer in order to establish accurate longitude position. Or "Over the Edge of the World" by Laurence Bergreen which describes Magellan’s circumnavigation of the globe. Both are excellent and enjoyable reading. * A type 5 pfd with built in harness and tether. After using mine to sail almost 15,000 nm it is time to think about a replacement. – a must-have for cruising the Chesapeake. 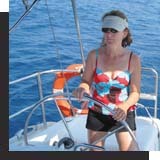 Planning a charter in the Caribbean or Med?, think about a cruising guide for that area. * Charts for your planned charter trip. I personally love to look at my charts and plan a cruise, even if I have sailed the area many times before. There are always new and interesting places to visit. Your charts and cruising guides are indispensable. – I definitely need to think about replacing mine as well! No matter who your special sailors are, they’ll love any nautical gift. R&R Charters and Sail School, Captain Penny, Captain Rich, Captain Amy, Captain Kathy, and myself wish all our students and clients a very happy and safe holiday season! We look forward to sailing with you in 2014! With the sudden long cold spell, I have been busy putting the boats to bed for the winter. Amici has her few systems winterized, but her sails will stay on for those warmer mid-winter days when I want to do a couple hours of cold weather sailing. She is my choice for those short day sails – lots of fun and full of zip. Moondance has all her systems winterized and her jib stowed. I didn’t have time to remove all the other canvas before the cold rain began to fall. Maybe I’ll have a sunny day in the near future so I can stow her main, dodger, and bimini and then cover her with her tarp. Zufrieden also has all her systems winterized, but I didn’t have time to stow any of her canvas! Maybe I’ll leave her sails on for the winter just in case I want to take a longer, drier winter sail. Decisions, decisions. Needless to say my body has now been into all the tiny holes on the boats, and my muscles and joints are telling me that perhaps I overdid it. At least in the spring it’s so much easier to commission the systems. But that’s another story..
"ASA Sailing Made Easy" "ASA Coastal Cruising Made Easy" "ASA Cruising Fundamentals"
Most of us are not as “lucky” as Captain Ron or Captain Bill, who are sitting in the warm weather of the Florida Keys or the South Pacific. We all live well north of these areas. My students often ask me when my sailing season ends. That’s a difficult question to answer, since it’s not unusual for me to be out on the water in December, January, or February. You just need to be prepared! I want to be sure the boat is stocked with cold weather provisions like hot coffee, hot tea, and lots of hot soup. Notice the key adjective "hot". Nothing tastes as great as a hot drink or hot meal, when the north wind is blowing across the water. I also want to be sure all the necessary through-hulls are open. Most times, this would only be the engine raw water through-hull for the cooling system. Other systems, head, and fresh water house system, remain winterized because I’ll only be doing a bit of day sailing. Naturally, I don’t want to be on the water in a winter storm, so I'll choose a good weather day. I also want warmer temperatures with no arctic polar air mass pushing down from Canada. There are many days when the temperature will be well above 40° with warm sunshine – the best days to experience cold weather sailing. Finally, I prepare myself for the weather. If you’re a downhill skier, you know all about dressing in layers to keep warm. I'll begin by donning my long underwear and warm, woolen socks. Next, I'll pull on a pair of loose-fitting jeans and a flannel shirt. Over the shirt I'll put on a wool sweater. Then, a pair of ski pants along with a pair of insulated boots. For my upper body, I usually add a hooded pullover beneath my ski jacket. Don’t forget the warm woolen ski hat and a great pair of ski gloves! I am not a big fan of wearing a face mask, maybe because I wear glasses and the mask always seems to fog them up. You won’t be completely dressed until you add your PFD and tether – you definitely don’t want to find yourself in the water during a winter sail! So, keep your eye on the weather, and when you see one of those warm, winter days approaching, give me a call and come experience cold weather sailing! In this season, everyone’s looking for a good restaurant. Don’t overlook Kent Island! * My first recommendation is Annie’s. 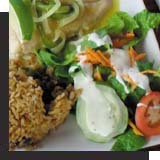 They have a great menu featuring huge sandwiches, great salads, steaks, and seafood. Their cream of crab soup is still the best on the bay, and their Sunday brunch is fantastic! * Next is Kentmorr Restaurant, located on the western shore of Kent Island overlooking the bay, so you can watch the passing freighters. Their crab cakes are the best – and then there’s the homemade coconut ice cream and coconut cake. * My final choice is The Narrows Restaurant. If you’re lucky enough to have a table on their enclosed porch, you can watch the boats going through Kent Narrows. My all-time favorite is rack of lamb, while Penny’s is the crab cake and filet mignon. R&R Charters and Sail School wishes everyone a great Thanksgiving! Penny and I will be hosting our large extended family this year. We hope everyone enjoys the time with their family as much as we do. 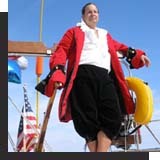 If you attended the Annapolis Sail Boat Show – drop me an email to let me know what you did there. I’ll try to share your fun in a future issue. The 2014 class schedule is now posted! Check out the website, and make your plans for next season’s classes and charters. Special thanks to all my students and charterers who sailed with us this season. Some had the opportunity to sail with Captain Rich, Captain Amy, and our newest instructor, Captain Kathy. From all five of us, thanks for a great 2013. We look forward to sailing with you again next season! During the holidays, there are many special events happening on the Bay. There are lighted boat parades, fireworks, and special holiday activities such as St. Michaels Christmas and Annapolis Midnight Madness. 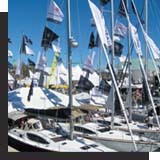 The Annapolis Boat Show will run Thursday, Oct. 10 through Monday, Oct. 14 – great days to shop until you drop. Obviously, if you are in the market for a new boat, this is the place to do that! Every dealer will be offering show specials which often include great electronic packages and discounts. I’ll be spending time with Tim Wilbricht discussing the Beneteau 41’ – this seems to be the year for us to take the final plunge! Sailing apparel is next on the list. Penny likes the Zeus tent. They offer great discounts on shirts, jackets, pants, sweaters, etc. 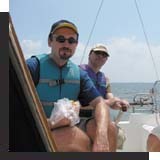 from various sailing activities along the East Coast. You can find shirts for the Block Island Race and many other special events. Last year she found a fleece jacket they were practically giving away. I personally like the Gill tent. They sell wonderful foul weather gear, and some really great pants, shirts, socks, etc. A number of years ago I purchased my foulies there. It's time to take a close look at what they have this year – not sure if I will spring for a new set or wait, and get one more good year out of my current ones. 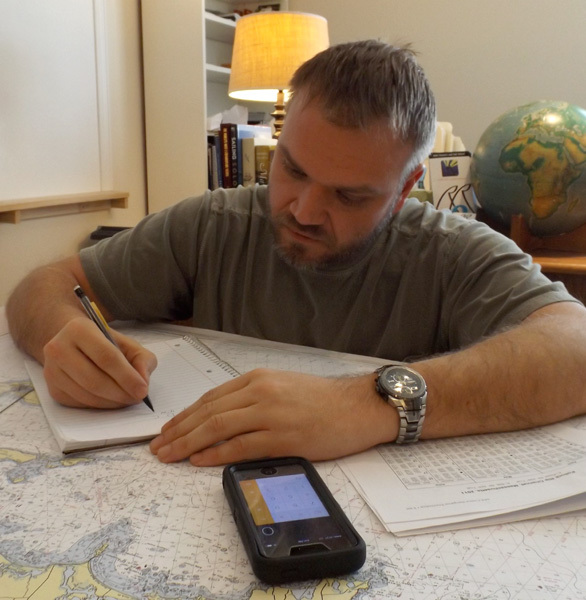 Onward – to Landfall Navigation and Maptech for the most current charts and navigation gear. I'll probably need to purchase a new set of charts for Block Island to the Chesapeake. After using my old set for numerous runs up and down the coast, they’re a bit tattered. It might be helpful to be able to read the buoys and depths through all the course lines and eraser marks! My annual purchase always includes the new tide, current, and nautical almanacs for the coming year. It'll be great to explore the latest electronics at Ray Marine. Most often I am just window shopping. I like to see what the newest chart plotters and radars do for improving safe navigation. And, of course I'll stop by West Marine to see their boat show specials. A couple of years ago they had a great propane grill for Moondance! What are you interested in buying at the show? Maybe a deck chair, a set of pots and pans, some sail cloth or sunbrella, a piece of teak – just let your imagination run wild! If it's something you'd find on or near a boat, you can find it at the Annapolis Sail Boat Show! And for those of you who don't want or need anything – come on out and just enjoy the sights, smells, and the excitement. See you all there. Right now is the greatest sailing of the year! The weather is clear and crisp. The wind is steady and cool. The daytime temperatures are comfortable; you may even need a sweatshirt or sweater; evenings and nights are cool and perfect for sleeping. Best of all, most of the boats have disappeared from the bay, even on weekends. I personally enjoy dropping the hook in one of the quiet coves in the Wye River or Langford Creek and relaxing in the cockpit while listening to the newly arriving ducks and geese. Trees take on their annual colored leaves, and overhead the bald eagles circle looking for their evening meal. The stresses from daily life just disappear! If you have not sailed during October, now is the time. Gives us a call – it's not too late to do a sail class or a charter. We look forward to sailing with you! Remember sailing is more than just a passion – it's a way of life. It’s time to register to take one of our winter season classes! The updated class schedule and 2014 class dates will be posted on the website in just a couple of weeks. Be sure to check it out. Everyone has a wish list of things to do – I certainly do. One of these years real soon, I want to sail across the Atlantic Ocean, and cruise the Med with my own boat instead of a charter boat. I’ve studied the various routes, and believe I’ve made my decision on the best one for me. I plan to sail from the mouth of Chesapeake Bay to Bermuda, from Bermuda to the Azores, and finally from Azores to Portugal. Once I arrive in Europe, I will sail coastwise to Gibraltar, based on good weather windows, and enter the Med. From there the cruising area is nearly unlimited – Spain, France, Italy, Croatia, Greece, Turkey, Malta, Cyprus, North Africa. I wonder when I should plan my return trip? Even though I have sailed various areas of the Caribbean (Bahamas, BVI, St. Martin, St. Bart’s, Anguilla), there are so many other places I want to explore with my boat. One of the nice “cold season” trips would be coastwise south to Florida, then cross over to the Bahamas. Yes, I have already sailed there, but not with my own boat. While sailing there, I can just continue south to Turks and Caicos, Dominican Republic, Puerto Rico, the Virgin Islands, the Leeward Islands, and when it is time to head back home, just turn north and sail directly back to the Chesapeake Bay. Then of course, I want to sail around Cape Horn. I know, that must seem nuts, but I don’t plan to use my own boat. There are some very good charter captains in Chile who regularly make this trip. I have read many articles written by sailors who have taken advantage of their service. I certainly can’t forget the South Pacific! I want to charter in New Zealand, Australia, and Tahiti, just to mention a few great areas for sailing. There are numerous charter bases I could take advantage of, since I do not plan to sail my own boat there. 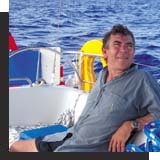 Maybe if I did, I might end up like my good buddy Captain Bill, who seems to have become “stuck” in Fiji while doing his around the world solo sail. And no, I do not plan to circumnavigate the globe. There are so many places I want to visit, and that would take time away from accomplishing my other goals. So, what are your sailing life goals? R&R Charters and Sail School can help you take the first steps toward achieving your personal goals. Drop us an email and get started today. Sailing Daydreams – It’s Showtime! It’s time to plan ahead for the upcoming sailboat show in Annapolis. This year the show runs from October 10 – 14. Stop by the Sunsail tent and speak with Jennifer Caruthers. She can help you work on that list of dream sailing locations. After chartering numerous times with Sunsail, the Greek Ionian Sea is still my favorite. Maybe I’ll need to return again next year to share Greece with my three grandsons. Our newest baby granddaughter is still too young to do that cruise.....but not for long! As usual, there’ll be numerous new boats in the water for you to board, explore, and dream about cruising on. You’ll definitely want to visit Annapolis Yacht Sales and their new Beneteau’s. Be sure to speak with Tim Wilbricht, and begin your dream! Don’t forget to stop by the ASA booth. Penny and I will be there some of the time, but other sail instructors will also be staffing the booth. In case you forgot, ASA is celebrating its 30th anniversary this year. They will have some special opportunities to win ASA gear or books. 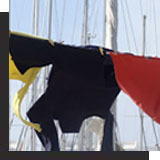 Of course, there’ll be unlimited opportunities to purchase sailing equipment – clothing, books, electronics, etc. If you are looking for a great deal on foul weather gear, do it at the show. A true sailor will definitely need that! In fact, I may have to replace my own this year. It seems I’ve spent so much time wearing mine, it’s wearing out! While visiting the show, you’ll want to eat. We always have breakfast at Buddy’s Buffet. For lunch we like Pusser’s on the upper terrace at the Marriott where there’s always live music. Of course, all the seminars are inside the hotel in one of its conference rooms. Make your plans and mark your calendar. I know everyone must think I’m a bit crazy, but I love the month of August for sailing! People always seem to think that this month is terrible for sailing on the bay. I personally find it enjoyable. Unlike July, which seems to be hot 24 hours a day every day, August evenings bring cooler temperatures. And most times during the day, I find some nice wind to bring me to some of my favorite locations on the bay.. I enjoy the warmer water here on the Eastern Shore. And, even though the hot weather brings out all those nasty sea nettles (aka jelly fish), I can always find some interesting anchorages which have too much fresh water for them to thrive. One of these is a quiet little cove up Langford Creek, appropriately named “Lovely Cove”. It truly is lovely. Penny and I especially like to arrive early, and spend hours floating in the warm, refreshing water while waiting for the crabs to wander into our traps. Sometimes, I like to take a dinghy ride up the creek looking for animal life, and just enjoying the fresh air and sunshine. Penny enjoys paddling her kayak into the smaller coves along the shoreline. Without an outboard, she can quietly approach birds chirping and feeding in the shady undergrowth near the water’s edge. In late afternoon, some of our friends usually arrive after getting a later start from the marina. I have already steamed the crabs and picked them, and Penny has made her famous crab dip for happy hour. As the sun sets behind the treetops, we all relax in the cockpit to share stories, and enjoy each other’s company. After an evening of fun and fellowship, it’s time to head below for a great night’s sleep. The cool evening breeze has cooled off the interior, unlike those hot, humid July nights. The next morning, after breakfast, our friends head back to the marina to pack up and drive home to face another week of hard work. Penny and I really enjoy those weekends, and try not to have any obligations scheduled for Monday so we can remain at anchor, or maybe head over to another quiet anchorage to spend Sunday out on the hook. Call me crazy, but hey, where would you like to be – at work on Monday morning, or waking up on a boat with no other boats in sight? R&R Charters and Sail School can make it happen for you! Give us a call today. Sailors always need to be aware of weather. Of course you can listen to the VHF weather station while on board, but for planning any kind of extended cruise, you will want to look at potential forecasts. I use two sites for this for sailing on the bay. 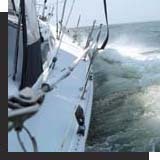 National Marine Weather Service (http://www.nws.noaa.gov/om/marine/home.htm) – extended forecast for any cruising area in the US including wind and storm. National Hurricane Center (http://www.nhc.noaa.gov) – helpful for sailors as well as anyone who lives near the coast. Hurricane season runs from June 1 through October 31. You really should be checking this site several times a week. Of course R&R Charters and Sail School offers the ASA 119 Marine Weather course which will prepare you to deal with lots of weather situations, and give the student an excellent grasp of weather patterns. Check it out! Those lazy, crazy, hazy days of summer have lots to offer! Response to last month’s Dreams article was very interesting. People emailed me saying things like, ”That’s what I want to do!” “It sounds like my dream!” etc. Most interesting, was an email from my good Aussie friends, Terry and Carol, wanting to know why they weren’t included in the article. Well, last month I only mentioned people I had sailed with during May. But, Terry and Carol, here’s your story. About two years ago, I received an interesting call from a gentleman with a strange English accent. He and his wife had just purchased a 42’ Catalina, and he wanted me to do a shake-down cruise with them, and give them some suggestions for preparing their new vessel for an extended cruise. 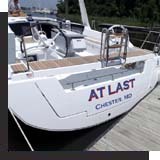 We set out on a week long cruise around the Chesapeake, including the Choptank, Annapolis, Rhode River, and several other interesting sights that most cruisers enjoy visiting on the bay. During that summer, Terry and Carol completed ASA certification for 101, 103, and 104. In the early fall they did the 105, Coastal Navigation. 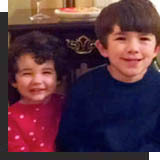 Then one morning in early November, 2011, I waved them off on their adventure. Over the next several months, they traveled south along the US coast, and crossed over to the Bahamas. After spending some time cruising the islands that winter, they met up with the trans-Atlantic flotilla in Marsh Harbor, and after a week of sailing, arrived in Bermuda. They relaxed a bit, provisioned for their ocean crossing, and headed for the Azores. During this passage, they experienced a bit of “rough” weather, but finally arrived safely. They cruised through the Azores until departing for Horta and Portugal. Once they reached Europe, they enjoyed day trips around the countryside on the way to Gibraltar, where they waited for a good weather window to enter the Mediterranean Sea. During the summer of 2012, they enjoyed adventures around the southern coast of Europe, and finally headed to north Africa for the winter where they secured their vessel, Common Sense, in Tunisia. 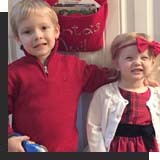 They flew home for the holidays to spend some time with friends and family whom they had not seen for nearly two years. I am not sure when they plan to depart the Med – there are still so many places to visit. Maybe in a few years, they’ll head back to explore the Caribbean before heading across the Pacific on their way home. But, naturally they will always be welcome to fly back to the states for a visit on the bay with R&R Charters and Sail School. What is your dream? What can we do to help you on your way? The summer has just begun, and the timing is perfect to begin to make your dream a reality! You’ve seen racing crews all sitting on the “high side” as their boat heels at a nice 30+ degree angle. This is not cruising! The adage for cruising is, “Gentlemen do not sail to windward.” I can’t imagine sailing on that angle for days on end. As a cruiser, it is important to understand how and when to reef the sails. So far this season, I’ve spent most of my time on the water with reefed sails. 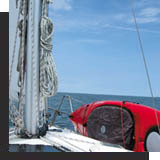 As the wind increases in speed, the boat heels more to allow the excess wind to escape from the top of the sail. With increased wind speed, the waves, which are caused by the force of the wind, increase in size. Both the wind and the waves will make it less safe for the crew and the vessel. Whenever the heel is in excess of 15 degrees, it’s time to reduce sail. Some have traditional slab reefing, while others have roller furling for both jib and main. You will want to know how to reef in order to make the ride more comfortable and safer. Most of you know I am living my dream of sailing and sharing my passion for the sailing life. I know every student who comes to me has their own dreams. So I thought I would share of few of these with you this month. Jacob and Jill arrived last month for their ASA 104 Bareboat Cruising class aboard Zufrieden, and shared their dreams with me. This class prepares students to charter a sailboat anywhere in the world, to explore new places, new cultures, and new experiences. Jacob and Jill dream of buying their own cruising sailboat and setting sail on their own exploration of the world. They dream of journeying to the Caribbean, Europe, South Pacific, and Asia. Maybe one of these years when I am sailing in the Caribbean, I will bump into them as they live out their sailing dream. Eberhardt, on the other hand, wants to explore different areas of the Chesapeake Bay. 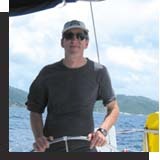 He has completed his ASA 106 and has done several bareboat charters in the northern area of our beautiful bay. Last month he came to R&R Charters and Sail School for a 3-day charter to the Wye River, and Oxford on the Tred Avon River, two of my favorite destinations. Eberhardt enjoyed the peace and quiet of the rural bird sanctuary on the Wye, but unfortunately, didn’t see any bald eagles. On the second day, we sailed to Oxford, a quiet, Eastern Shore town – no big stores or fast food places here. On our return trip to the marina, Eberhardt had the opportunity to sail with Zufrieden’s spinnaker. The big smile pasted on his face told the shear joy of flying fast down wind! He will be back for a long cruise and perhaps a bareboat aboard Moondance to continue exploring the best area of the bay. 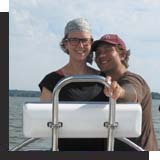 Jesse and Christine, who have completed their ASA 104 and enjoyed a couple of bareboat charters on Moondance, are thinking about purchasing a boat to live aboard. Jesse plans to continue his education, and neither wants to give up their apartment in NYC. So why not live aboard their own boat while Jesse completes his graduate work, enjoy the sailing on weekends, and perhaps make plans for some extended cruising south. Ed and Elizabeth, already own their own Morgan 34, and came to me to learn how to sail. 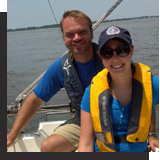 Ed is a former powerboater, and Elizabeth has done some sailboat racing. Both want to learn and improve their skills. They dream of casting off the dock lines and heading south – to Florida, Bahamas, and who knows where adventure might lead. Dave and Jeff completed their ASA 103 and are looking forward to doing the ASA 104 in the near future – perhaps aboard one of our boats in the BVI’s as Jeff suggested. Good friends during their high school years, they lost touch until a few years ago when they discovered each other on facebook. Dave wants to charter when his job as a commercial pilot takes him to various locations around the world. 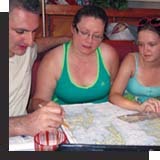 Jeff dreams of taking his family along on sailing vacations during his summer teaching break. These are just a few of the dreams that R&R Charters is helping to bring to fulfillment. Captain Penny and I feel very privileged to be a part of our clients’ dreams; this is our biggest reward. So what is YOUR dream? Let us help you take those first steps toward living your dream. To live out your dream of cruising, anchoring safely and properly is number one! 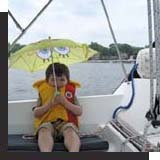 You want protection from the wind, the waves, and other boaters, enough depth for your boat, and enough room for your boat to swing on its anchor. You’ll want to know what kind of bottom there is, and that there’s no threat of dragging ashore. After you’ve chosen the spot, approach slowly, and stop the boat. Let the wind and current begin to move the vessel astern or use a little reverse. Lower the anchor, paying out anchor rode until it’s about 5:1 ratio. Do a quick wrap around the cleat, allow the anchor to begin to dig in, and ease out the rode until you have 7:1. Remember the ratio is the depth of the water + height of the bow + the tidal range! At 7:1, reverse at 1500 rpms and hold it for one minute, more for heavy weather. Take bearings on fixed objects along the shoreline and when you are sure the anchor is set, ease off, shut down the engine, sit back, relax, and enjoy life. The boats are scrubbed! The little repair items have been completed! And the weather is finally warm! Let’s go sailing! As I look at my schedule, things are filling up, but we can always fit you into the schedule. We can’t wait for the first students and charter people to appear on O-Dock. Last Saturday, Penny and I spent most of the day finishing the cleaning and repairs. Moondance is ready for you! Some have already booked her for their own bareboat sail. 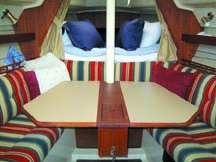 She is ideal for a weekend sail with two couples. Just take a look at her interior! 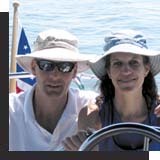 One of our couples even took her for a four day cruise to Annapolis, St. Michaels, and the Wye River last season! We still have the teak to refinish – a never-ending job. I also need to find a few days when Amici and Zufrieden are idle, so I can haul and repaint their bottoms. If you have never worked on bottom paint, you just can’t imagine this task. You crouch under the boat on your knees while you sand the entire bottom. At times you are even lying on your back looking up at the hull – all the time wearing a protective suit, breathing mask, and goggles. Once you finish with the sanding, it’s time to tape the boot stripe and then apply two coats of bottom paint. Fortunately, each coat dries quickly so you can complete that task in just one day. While the boat is sitting on the hard, you can more easily apply a good coat of wax to the hull. With good weather, I can complete this job in only a couple of days and have the boats back in the water ready to go. Next time you step aboard, just visualize me working on the bottom so you can enjoy your sailing time without having to deal with the work. 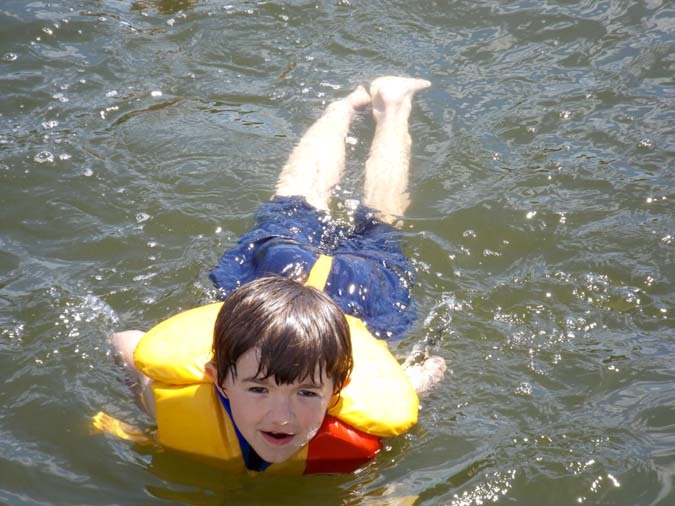 This is one of our favorite boating activities! Penny and I enjoy joining up with our friends in one of the many great coves around our section of the bay. This gives us all a chance to socialize, and it’s always interesting to smell the mouth-watering aromas rising from the grills on each boat. Afterward, we gather in someone’s cockpit and share sailing adventure stories – all of which are 100% true and factual, of course. One of the first things to do when forming a raft, is have the largest boat become the anchor boat. Quite often this is Zufrieden. After setting the anchor with lots of extra rode, the other vessels begin to approach. You’ll need plenty of fenders to protect the topsides. 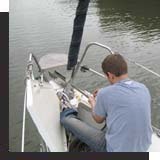 It’s also important each vessel uses a bow and stern line, as well as a forward and aft spring line. 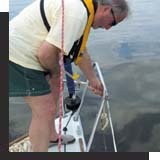 You’ll also need to position each boat’s spreaders slightly astern, so the standing rigging does not become entangled. Finally, you’ll need a “bad” weather plan. At times we’ve found it necessary to break up the raft, with each boat setting its own anchor. We allow the weather to pass, and then reform the raft. That is a decision for the anchor boat captain to make. If you’re ever out on a great weekend and happen to approach a large raft of boats in an Eastern shore cove, it just might be Zufrieden along with other O-Dock boaters. You can bet that Memorial Day will find us on the water with our friends, celebrating the holiday and enjoying the company. Try it! You’ll like it! 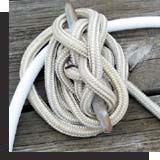 Use this knot to attach a mooring line to dock hardware. 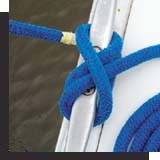 Our boats have ridden out hurricanes, heavy weather, and winter storms with this simple knot. When properly tied, it can be released in an instant! Take a turn around the cleat, followed by a simple figure 8 around the two horns. For the last turn, flip the bitter end under the loop before placing it on the horn. The two parts of the line running atop the cleat should lie parallel to each other. The stronger the wind blows, the tighter the line grips the cleat. The strain is all on the bottom of the line, leaving the top end easy to release. Which of these photos do you think shows a correctly tied cleat hitch?. This year marks American Sailing Association’s 30th anniversary! When Lenny Shabes, founder of ASA, began the business, his main objectives were to introduce uniform sailing standards to the US, and unite the many independent sailing schools across America. Today, we have over 2000 certified sailing instructors, and more than 300 accredited sailing schools in 18 different countries around the world. Over 400,000 students have earned certification from ASA 101 through ASA 108 in addition to the many endorsements courses like docking, marine weather, and radar. R&R Charters and Sail School is proud to be a part of this great organization. In 2013, ASA will be sponsoring various flotillas, nationally and internationally. All ASA members are invited to participate. ASA is also conducting a photo contest. You can check out their Facebook page for more information. They’re looking for “Best ASA Sailing Photo”,” Best Sailing Lifestyle Photo”, and many other categories. At this year’s Annapolis Boat Show, ASA will be holding a large celebration party. It seems like only yesterday Captain Penny and I attended the 25th celebration. Last year, ASA adopted the charity organization, Hands Across the Sea. This non-profit organization is dedicated to raising literacy levels of children in the Caribbean. As a retired public educator, I am very pleased to have contributed to this great organization last year, and R&R Charters and Sail School will also contribute this year. We would be happy to have our students become part of this great organization, too! You can contact us and donate to this organization through us. Join us in celebrating ASA’s 30th anniversary! All three boats are cleaned inside! There’s still all the outside work to do, since the weather has not been very cooperative in March. Soon, the marina will be turning on the dockside water and I’ll be scrubbing. Within the next couple of days, the boats will have their shake down romp! Classes are beginning to fill up, so check your schedule, and don’t miss out on your primary dates for a class or charter. Those of you who have completed the ASA 104 class with R&R Charters and Sail School have the opportunity to use Moondance for a bareboat charter! 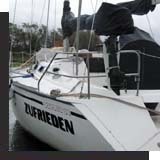 Zufrieden is always available for a captained charter. Our marina friends are beginning to arrive back on the dock to prepare their boats for the 2013 season. We’re expecting Rich and Betty to be returning after having sailed to Florida for the winter. I’m sure they’ll have many tales to tell. 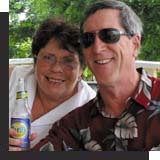 Friends, Ron and Theresa, are continuing to enjoy their life aboard in Key West – we certainly miss them on the dock. And our good buddy, Bill, is making 2013 departure plans from Fiji as he continues his around the world experience! Sailing! It’s not just a relaxing experience, but a way of life. Maybe it’s time for you to cast off the “dock lines” of life, and head out to sea. Captain Penny and I look forward to sailing with all of you in 2013! Co-founders, Harriet and Tom Linskey, are also retired educators. While sailing in the Caribbean, they began bringing library books to the local schools. With our help, their goal this year is to outfit 8 to 10 Eastern Caribbean school libraries with brand new books. There is nothing more rewarding than opening the world to young children through reading! Carol and Terry spent some time back home with family and friends during the Christmas season, and now are back to their boat in the Med. They spent the winter in Tunisia. After they finish a few boat chores (why does it always seem like those chores are never ever completed? ), they are planning to sail to Malta, then onto Italy, and finally to Greece and perhaps Turkey. Penny and I may just have to join them in Greece and do some spinnaker training. I picked up Amici’s cleaned and repaired sails this week! It must be time for spring cleaning. I have to admit this is not one of my favorite boating activities. It's sort of like doing laundry – by the time you finish all the jobs, it’s time to start over again. It seems it never ends. As the weather warms up, I'll begin to uncover Moondance and Zufrieden, and open all the hatches and ports. There's nothing like fresh, clean-smelling spring air to drive out that “closed-up” smell. I'll use fresh water and strong soap to scrub the interior of each boat. And of course I’ll wash all the dishes, pots and pans, and spray all the cushions and fabric with Febreeze. Once the interiors are clean, it'll be time to scrub the outside. I'll take my power washer to the marina and wash the decks, cockpits, and topsides, cleaning all those special “gifts” the seagulls deposited on board during the winter! But I still won't be finished! I’ll need to scrub the decks with fresh water and boat soap. It’ll only take two days to do all three boats. Next it’ll be time to redo the teak on Amici and Moondance – a few days’ work. During the season, I’ll remove all the old varnish from Zufrieden and redo her teak. Finally, it’ll be time to wax the decks, cockpits, and topsides of all three boats. That’s an easy calculation – 1 day for Amici, 2 days for Moondance, and 3 days for Zufrieden. Good thing I've been doing my exercises all winter! With good weather, I'll be finished with all the spring cleaning jobs in just two weeks. Oh, and Amici and Zufrieden definitely need bottom painting! So come on aboard, I could use a good excuse to go sailing instead of cleaning!. Many sailors have the same questions and thoughts. Personally, I find celestial navigation problems relaxing and rewarding. 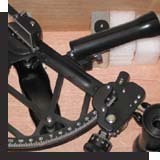 We use a simple format that’s easy to follow to solve all the celestial navigation problems. You need only do some simple basic math – addition, subtraction, multiplication, and division. Before taking a sextant shot, you’ll also learn to identify the stars and planets using the simple Star Finder, and then reduce the shot, and plot the fix on a universal plotting sheet. Learning celestial navigation, will make you a member of a very exclusive club of sailors who have mastered the subject, and it’ll provide you with a profound, personal satisfaction in finding your position on earth by referencing the sun, moon, planets, and stars. 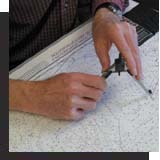 R&R offers the basic ASA 117 Celestial Navigation as well as the full-fledged ASA 107 Celestial Navigation. Get started with the ASA 117 which is a home study course. I guarantee you’ll enjoy the class. Then it’ll be time to take ASA 107 and learn to work with the stars, moon, and planets. Before you know it, you’ll enjoy doing celestial navigation problems just for relaxation.Most of you know I was a high school German teacher for 36 years. 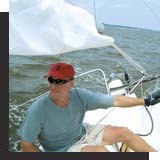 In June 2006, I retired from my public school teaching profession, and began R&R Charters and Sail School. What you may not know is I had planned for this many years before my retirement. My first step was deciding what I wanted to do after leaving teaching. Initially, I applied to do PhD work in comparative linguistics and literature, realized I would be writing all those boring academic articles that students hate to read. I do regret having never pursued my PhD – I love being a student. 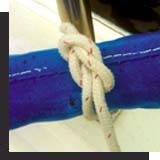 As you learned in the beginning sail class, this knot prevents the line from running through the block’s sheave. Whenever I step aboard a different sailboat, I first check all lines to make sure there is a figure 8 knot in all sheet lines and halyards. 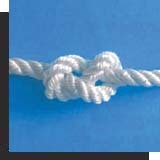 To tie this knot, first form the bottom half of the 8 by laying the bitter end over the standing end. Next, bring the bitter end under the standing end to form the top half of the 8. Finally, take the bitter end through the bottom part of the 8. You have successfully tied the stopper knot! Moondance’s bimini and dodger have been checked, repaired, and cleaned. It’ll only take me a couple of hours to have her sails rigged, and the canvas in place. In fact, on the first good weather day, Moondance and I’ll head out for a brisk sail. It seems she’s happiest when leaping through the waves. And then there’s Zufrieden. She definitely needs a haul out, and her bottom cleaned and painted! It’ll take me three or four days to complete her work and do some minor repairs and upgrades. Zufrieden seems to prefer the longer sailing adventures as opposed to the short afternoon romp on the water. Of course, all will need a good wash down and a nice shakedown cruise. It’s always amazing after the boats have sat for about four months, they seem to need some unexpected repairs. But, after spending a couple of weeks working on the fleet, they will be all ready for you to hop on board for your next sailing class or charter. Most of you know I was a high school German teacher for 36 years. 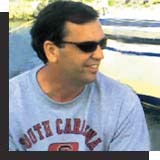 In June 2006, I retired from my public school teaching profession, and began R&R Charters and Sail School. What you may not know is I had planned for this many years before my retirement. My first step was deciding what I wanted to do after leaving teaching. Initially, I applied to do PhD work in comparative linguistics and literature, realized I would be writing all those boring academic articles that students hate to read. I do regret having never pursued my PhD – I love being a student. Realizing, I could pursue a career teaching and sharing my passion for sailing, I’d need a Coast Guard Captain’s License. I spent 56 hours in class, passed the tests with flying colors, the owner of the captain’s school asked me to become one of his instructors, and so it began. Penny and I often reminisce about a vacation many years ago, sitting on Martha’s Vineyard and looking at all the sailboats on their moorings. We looked at each other and said, “Wouldn’t it be nice, but it will never happen.” Well, it did happen because we planned and moved forward to fulfill our dream. 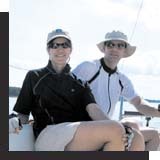 Since then, we’ve sailed extensively on the Chesapeake Bay, Mediterranean, and the Caribbean. My point in sharing this with you? Pursue your dreams. Make your plans, learn what education you need, and move toward achieving your goal. Continue to take sailing classes, charter, and dream of sailing over the horizon. Resolve to begin to live your dream today. Make this the year you take the first step toward fulfilling your own “wouldn’t it be nice” dream. We have, and we’ve never regretted that decision! Though Penny and I had sailed for many years, I still had to follow the required steps to become a certified American Sailing Association instructor. I needed to attend an instructor qualification clinic, IQC. My first IQC was five days long. I was required to demonstrate my teaching skills as well as my sailing skills for ASA 101, 103, 104, and 105. After successfully completing this, I began teaching for some of the sail schools located on the bay. Of course, since I love being a student, I didn’t stop at this level. I’ve attended many other IQC’s since then, and I’m not finished yet! I plan to complete my instructor certifications for ASA 108, Ocean Passage Making and ASA 114, Cruising Catamaran. R&R Charters and Sail School wishes you all a Happy and Successful New Year! We are looking forward to sailing with everyone in the upcoming sailing season. Whether you are a beginner or advanced sailor, we have something for everyone – instructors certified to instruct ASA 101 through ASA 107, as well as many ASA endorsement courses. Before warm weather arrives, you should plan to take one of the classroom courses such as ASA 105 Coastal Navigation (my personal favorite class! ), ASA 107, or Celestial Navigation (a great mental challenge). 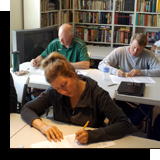 R&R has an instructor certified in ALL the endorsement classroom courses, ASA 117 Basic Celestial Navigation, ASA 119 Marine Weather, and ASA 120 Marine Radar. All three of these offer the student lots of great insight into the particular topic of the course. Even while the winter wind is nipping at your nose, be sure to check out the on-the-water class schedule, and book your class today. Last season, the class spaces filled up early and quickly, and unfortunately several people were unable to schedule a class on their optimal dates. Don’t be one of those people this season! 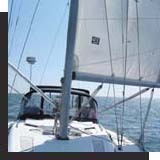 Why take a professionally taught sailing class? I have discovered more and more charter companies are looking for documentation that their charter clients have had professional training. R&R Charters and Sail School has had numerous skilled sailors come to us to help them gain this documentation so they can bareboat. Insurance companies are becoming more demanding that individuals show this training. Personally, I am continuously expanding my own education. This past year I’ve completed my instructor certifications for both the Basic Celestial Navigation ASA 117 and Celestial Navigation ASA 107. My personal educational goal for this new year is to complete my certification for Ocean Passage Making, ASA 108. So what is your sailing goal for 2013? R&R Charters and Sail School has numerous opportunities to practice your skills using one of our boats. You can always schedule a couple of hours on the water with Amici. Take friends and family out for some relaxation, and enjoy the warm air and sunshine. If you’ve completed R&R’s ASA 104 Bareboat Cruising, you can opt to take Moondance for a day or weekend sail. 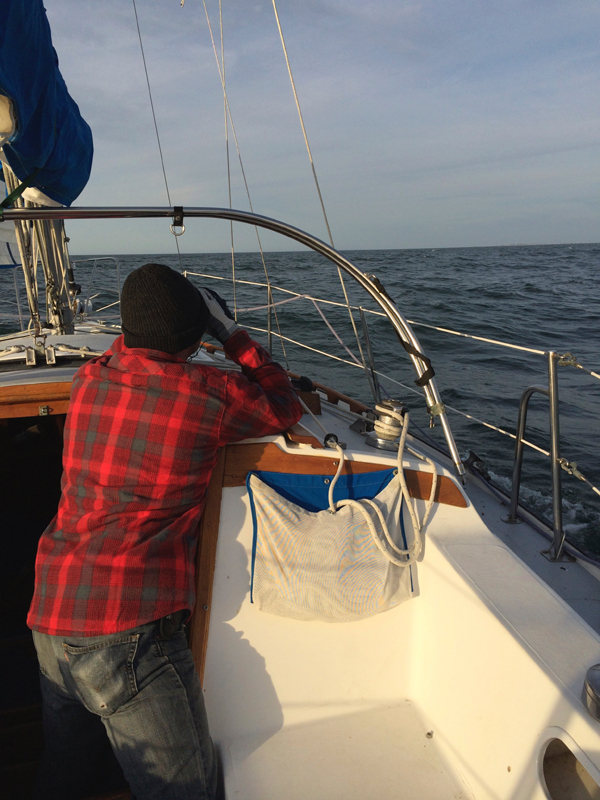 Last fall, two of our students, Josh and Christine, spent four days sailing the bay on Moondance. They visited Annapolis, St. Michaels, and the Wye River. You should have seen their big grins as they returned to the marina after spending this time on their own! For those who feel more comfortable charter sailing with one of our instructors, there are unlimited opportunities aboard Amici, Moondance, or Zufrieden. Imagine planning a week-long cruise aboard Zufrieden, and exploring great anchorages and ports of call, while having a captain there whenever you need some assistance in a tense situation. Drop us an email or give us a call and plan that dream sailing vacation now! 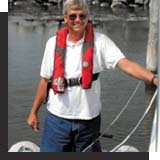 He’s R&R Charters and Sail School’s newest instructor! 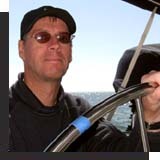 He holds his professional USCG captain’s license and is a certified instructor for ASA 101 Basic Keelboat, ASA 103 Beginning Cruising, and ASA 105 Coastal Navigation. 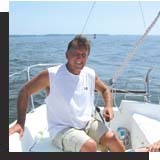 Captain Rich has sailed extensively in the Chesapeake Bay, along the California coast where he grew up, the Greek Isles, and the BVI. Just as Captain Penny, Captain Amy, and I all do, he truly loves sharing his passion for sailing. 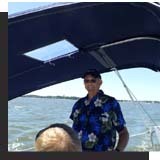 When Captain Rich isn’t teaching, he enjoys sailing with his first mate Sandy, aboard their Hunter 34, Rhapsody, and rafting up with friends. The boats are ready to take their well-earned winter rest. I hate putting them to “bed”, because I know I’ll be restless not being able to just hop on one of the boats and head out on the water. Amici is such an easy boat to winterize, and is also one that can quickly head out for a few hours of sailing on those warmer winter days – usually. Unfortunately, this is the year for her sails to go to the sail loft for repair and washing. I quickly dump the small fresh water tank, and pump the pink stuff through the lines. Then, clean the head, close the water intake, and pump some more pink stuff through the head system. Finally, I pour some of that nasty pink stuff into the bilge. Finished! Moondance already has her sails off for the season, her water system, head, and engine winterized. Outside she is wearing her blue tarp over her companionway, and has all of her lines doubled up for the higher winds that we experience during the cold season. I usually spend roughly four or five hours doing all these tasks. And then there’s Zufrieden! This is an eight hour job for me. I will need to empty the water tank, and flush out the fresh water lines before I pump the pink antifreeze throughout the system. I will also change the engine oil, and pump the raw water cooling system full of antifreeze. Finally, it’ll be time to winterize the heat exchanger with the antifreeze, and pour some into the shower sump, the refrigeration, and the bilge. Outside, I’ll need to remove the sails (Zufrieden’s sails spent last winter at the sail loft. ), cover the dinghy with her blue tarp and lash her securely to the foredeck, double the dock lines, and cover Zufrieden’s companionway with another blue tarp. Maybe next season I could winterize by heading south! But, in a couple of months, all three boats will be just as anxious for their shakedown cruise as their owners. 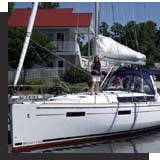 A Gift Certificate in Any Amount from R&R Charters and Sail School! 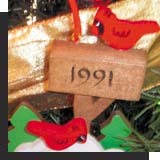 Just contact us, and we’ll make sure you have your special gift in time for holiday gift giving. From your marine supply store: I always use Landfall Navigation. If you order in the morning, you’ll have the gift within 3 days at no extra cost! 14kt Gold Sloop Charm Woman’s Fitted Helly Hanson Sailing Jacket Polartec Mock Turtleneck Top 14kt Gold Snap Shackle Bracelet An R&R Docking Class..... Without Her Spouse! 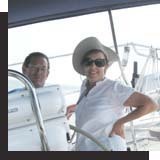 Couple’s Bareboat Charter to Greece on the Ionian Sea!!! Yes, I did finally arrive back in the Chesapeake from New England, about five days late. After having the fuel pump replaced in New Jersey, we continued to have some issues as we headed south. While beating and powering through 4’ and 5’ seas, the engine shut down again. But, after sailing into Atlantic City, my crew and I managed to reprime the engine. I believe the cause is a poorly mounted fuel filter. We continued our journey south along the coast at low RPM’s and safely delivered the boat to its owner. Of course, at the end of October, almost everyone on the East Coast was effected by hurricane Sandy. Each morning before class began, I arrived at the marina early to prepare the boats to ride out the storm in their slips. Having three boats to care for is a challenge, on top of the fact that I was teaching an ASA 101 class on the weekend prior to the storm’s approach. We spent lots of time out on the water on Friday and Saturday, and did most of the classroom work on Sunday so we could be ashore. On Saturday afternoon, after we returned from our sail training for the day, the students had a practical experience preparing Amici for the storm. We removed both the jib and the main, removed the canvas, added additional dock lines and fenders. I now sit in my family room listening to the storm approaching, with rising winds and rain. I think about my babies sitting all alone in their slips, and hope they know I did my best for them. Only time will tell. Once Sandy decides to bid us good-bye, I’ll be taking a trip to O-Dock to check up on them as well as all our sailing friends’ boats. After spending lots of time preparing, I traveled to Jacksonville, FL, to complete my instructor certification for teaching Celestial Navigation. Why would anyone want to learn this? Doesn’t GPS give you a more accurate fix? The best answer I can give you is this: If you like to challenge yourself, and expand your knowledge and understanding, I couldn’t recommend a better course than ASA 107. I personally enjoy taking the sextant shots, doing the calculations, and plotting my fix. It is very rewarding when you can look at your fix, compare it to a GPS fix, and realize that both are within the limit of error. I feel confident that I could make a passage using only celestial navigation and arrive at my destination. Besides, I think it is fun! I know – I have a “sick and twisted mind”. Finally, when you study navigation, every textbook encourages the student to always use “every available means”. 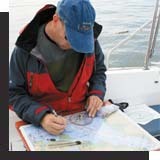 Which means – use GPS, paper charts, radar, charter plotter, AND celestial navigation. The 2013 class schedule is now posted online. Classes fill early, so don’t procrastinate! Check your schedule and register now! Many people wonder what I do when I'm not teaching a class or doing a charter. Well, when both Penny and I are free, we go out sailing, and raft-up with friends. Recently, our good friend Jeff, and his son Henry, met us and several other friends in Skipton Creek. It’s a very pleasant little spot up the Wye River. On shore, is a quaint little English Tudor guest cottage, and a larger family home surrounded by meadows and pastures where the owner stables his black sheep and reindeer. It is not unusual to wake up in the morning to hear his roosters crowing! What’s there to do on a raft-up? Simple! Enjoy each other’s company, swim, crab, and have great happy hours! We devoured Sandy’s famous meatballs; Jeff provided cheese and crackers; Penny prepared pesto cheese dip with fresh herbs; and Barb made a salad with strawberries and goat cheese. Our appetizers became dinner! Next morning we woke to the smell of fresh coffee brewing on all the boats. We chatted across the cockpits as we relaxed over breakfast. All too soon, it was time to leave the raft-up and sail back. Penny and I luckily had an extra day off, so we headed for St. Michaels and a great lunch. Naturally, Penny did a bit of sale shopping just to "save me money". While writing this article, I am sitting in northern New Jersey aboard a delivery adventure. I came north to pick up a very nice 37’ sailboat and bring it down to the Chesapeake from Connecticut. Upon arriving, we stowed our gear and began to prepare for our departure. That meant we had to put the sails back on, purchase provisions, and make some minor repairs. By the time we had all the chores completed, low tide had arrived, and we were stuck until the next morning. We topped off the fuel, cleared the inlet into Long Island Sound, and set sail for a fantastic down wind run to City Island, just north of New York City, where, we dropped anchor, to wait for a favorable current for the trip through Hell Gate. Soon we were passing Manhattan’s beautiful skyline. I have seen the Statue of Liberty several times by day, but she is especially beautiful at night with her torch shining brightly over the water. We were pounding through the ocean swells south of Sandy Hook Light, when the engine shut down. Since the boat had been sitting on the hard for two months, we suspected the fuel filter. It was dirty, and definitely needed changing, so we had to prime the engine – no luck! Try as we might, we just couldn’t bring fuel to it. We raised sail, and fortunately the wind was perfect for a beam reach down the New Jersey coast. We would be able to sail along, but later we’d need engine power to navigate the Cape May Canal, so as we were approaching the Manasquan Inlet, I called TowBoatUS for a tow into the inlet. As we were tying up to the dock, a service mechanic arrived to assist us. After Ken attempted to prime the engine for nearly an hour, he determined the fuel lift pump was defective – it just wasn’t bringing any fuel to the engine! The replacement was sitting in Massachusetts with the earliest delivery date on Monday. So here we are at a marina in Manasquan, New Jersey, waiting for the new pump to arrive. What do you do with your free time? There are a few available spaces for R&R’s March 2013 BVI experience. For $1700 per person you get 5 days of instruction and cruising including breakfast, lunch, snacks, and happy hours! 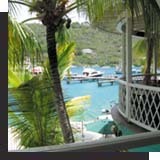 Your cruise will begin and end in Road Town, Tortola, BVI. 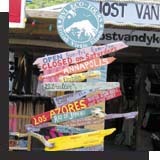 We’ll visit Jost Van Dyke and world famous Foxy’s Restaurant, The Bitter End Yacht Club, and The Bite, where there’s great snorkeling. Be a student or a cruiser. 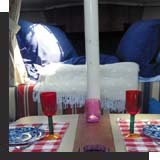 There’s even a queen berth for couples! After all of you leave for the season, I have those last few warm days to do some great sailing myself. I may be wearing my ski clothes, but I am out enjoying the sunshine on my face and the wind whistling by my knit hat. Often I dream I’m heading to the islands and sometimes I need to fight the urge to just turn the bow of the boat south. Maybe I will, soon. maybe one of these days real soon, I will just loose that battle. Wow! I can’t believe September is here already. It seems like only yesterday, I was commissioning the boats for the 2012 sailing season, and now it's nearly the end of the season. The good news is the days are cooler, the evenings are pleasant, and the nights are great for sleeping at anchor! There are still plenty more sailing days to enjoy. As I look back over the past months, I can remember great sails with great students. Some of you have come back for additional training; others have taken their first step toward a lifetime of sailing adventures. We have enjoyed sailing with all of you. We also miss those of you we haven’t seen this season. If you have that itch to improve your skills, or you have never stepped aboard a sailboat, it's not too late to register now. There's still space available for all levels of classes from ASA 101, Basic Keelboat, through ASA 106 Advanced Coastal Sailing. And of course, this winter R&R Charters and Sail School will continue to offer many classroom sessions in Coastal Navigation, Marine Weather, Marine Radar, and Basic Celestial Navigation. The approaching fall season also signals it’s Sailboat Show time! The Annapolis Boat Show gives us all opportunities to dream about that new boat, or a charter in some exotic location, new equipment, new clothes..... The dreams are limitless. Once again, I'll be working at the show, and like most of you, I'll also be exploring all the displays. Last year, my “dream boat” was the 54 Shannon – I wonder what it will be this year. Of course, I'll be booking my next adventure with SunSail at the show. I always enjoy the chance to speak with Jennifer Caruthers personally. But, reality does finally set in, and I do have to think about making plans to winterize the boats......but not quite yet! Let’s just put that off for another couple of months. Maybe, just maybe those weeks between Thanksgiving and Christmas will once again bring some nice warm, sun-filled sailing days! 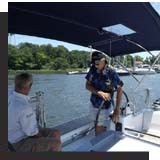 Part of the Bareboat Charter 104 class, is learning how to provision the boat for a longer cruise. Over the years, I’ve learned to give students some guidelines in developing their grocery list and menu. We always need 3 breakfasts, 4 lunches, and 2 dinners on a fixed budget. It is truly an unexpected pleasure for me, as students bring forth their unique meals while cruising about on the bay. I have had a Russian breakfast of ham, onions, peppers, and fried eggs, an Australian dinner of curried beef with rice, and some really delicious lunch salads. All the students quickly learn they don’t need to dine on canned foods and pre-cooked expensive entrees. We always purchase ingredients, and with careful budgeting and planning, we have great grilled dinners of New York strip steaks, or Ahi tuna steaks, or delicious salmon filets. Thanks to all my 104 students for their wonderful culinary delights! Make your plans now to join R&R Charters and Sail School in the British Virgin Islands for 5 days of great sailing and learning! The class will be held March 11-15, 2013. We will pick you up in Road Town on Tortola on Monday morning, and set sail for 5 days of amazing sailing fun – Jost Van Dyke, Marina Cay, Bitter End, The Bight......all the places you've heard so much about. Enjoy learning on the warm waters of the Caribbean with Captain David Renoll and Captain Richard Myers, both experienced BVI sailors. The fee, $1700 per person for 5 days, includes breakfast and lunch aboard our Beneteau 44, sail instruction for 103 or 104, and sail certification for 103 or 104. This is ideal for couples! Space is limited to the first six students to register. Email us now and reserve your BVI sailing adventure! Have you noticed how your definition of things changes as your skills, experience, and knowledge improve? When I first began sailing, I would never consider sailing in winds greater than 15kts. But as my skills and knowledge developed, this seemed just a nice pleasant day of sailing. In the past year I have been in winds in excess of 50kts both on the bay and on the Atlantic Ocean! Last month I asked what you would do if you were caught in this situation. My good friend, Gene, was the only person to respond. Most of you don’t know him, but he is one of the most experienced and skilled sailors I know. Often we would have our “friendly” sailboat race as we would head back to the marina after the weekend raftup. One little tacking error, and you would be assured of losing! Enough memories! What’s the answer to my question from July? As Gene stated in his email, it depends on your location. Last August as I was returning from an ASA 106 class, we were hit with a squall off the mouth of the Potomac River. We knew the storm would pass quickly, but we didn’t have much sea room. As the squall approached, we quickly dropped sail and powered up the motor. Using our engine, we carefully held our position into the wind and waves as the storm passed. This past June, I was 600nm off the coast of Georgia with lots of sea room. We had just experienced a gale force storm (+34 kts) an hour before, and had both our jib and mainsail reefed. It seems these storms always hit you during the night when you can’t see them approaching, but we were lucky to hear the wind pick up and the waves began to grow. We quickly doused the jib, and changed course to put us on a broad reach with the wind and waves on our port quarter. We also started the engine as an added precaution. In a very short time, the waves built to 14-16’ and the wind peaked around 55kts. When the boat was overpowered by the wind and waves, she simply side-slipped down the wave face, spilling the storm’s forces. After 45 minutes, the winds dissipated and the waves began slowly to diminish. I am certainly not advocating you all go out searching for these types of experiences, but you do need to challenge yourselves. If you’re afraid of those 15kt winds, go out in them on a clear day. Reef the sails so you feel more comfortable. Go with friends who have a bit more experience than you, and read articles written by other people in stressful situations. Most importantly, take the next level sail class. Keep in mind the boat is capable of handling these types of situations better than the human body. Do you have the winter “blahs” every year? Are you ready for an adventure? Would you like to explore the BVI’s, but don’t feel you have the skills and experience to bareboat charter? This March, R&R is offering a 5-day charter and sail class aboard a sailboat in the islands! You can earn your ASA 103 or 104 certification, and your favorite passengers are welcome to come along for the ride! Space is limited, so email Captain Dave for details, and make your reservation right away! Experience the life, while gaining the experience. C’mon down! 1. Yes, August days can be hot and humid, but unlike July, the temperature most evenings, falls to the mid-70’s. 2. There can be days without wind, but some of my best sailing days have been in August! There are also days without wind in the other 11 months. 3. I can’t personally control the weather, so I go with what mother nature gives me. As a result, I’m out on the water enjoying life, while other people are sitting in the marina lamenting. My prescription – let’s go sailing! Annie’s Restaurant still holds the title for best on the bay! Try a bowl with a splash of sherry. You won’t regret it! I recently brought a boat from British Virgin Islands to the Annapolis area. After a 10-day passage, we entered the Chesapeake Bay, and as we crossed the three mile line prior to entering, we hoisted the Q flag. It’s the all yellow one which represents the letter “Q” to tell all authorities we were entering US waters and had not yet cleared customs and immigration. At the same time, I called immigration to inform them that we were going to be docking at a marina in the Norfolk area. This person made arrangements for a border patrol officer to come to our vessel and complete the necessary paperwork for our entry. We first approached the fuel dock where we refueled, but we were not allowed to step off the boat. Once we were finished with our fueling process, we were directed to our slip. Again, we were not allowed to exit the vessel. In a very short time, Officer France arrived at our vessel. I cannot express how great a person he is! He treated us with pleasant professional courtesy. I asked if he could possibly process two of the crew first, one who had to be at work the next day in Washington DC, and another who needed to seek immediate medical care due to a personal health issue. Officer France did their immigration forms right away, and allowed them to depart the boat within 20 minutes of his arrival. During the entire procedure, we had pleasant conversation about our passage experience, and other personal experiences. We also learned that Officer France is a former marine who has served as a border patrol agent for many years. In fact, after the Iraq war, he was one of the US professionals assigned to Baghdad International Airport to assist the new Iraqi government establish good safety inspections at the airport. We had only one small issue arise during our clearance – Officer France had forgotten to bring along the necessary cruising permit paperwork for the boat. He promised me he would deliver it the very next morning. And he did! During my experience I thought of the many times I had entered the US at various airports along the east coast. None were as cordial, and many were actually rather intrusive. As Officer France disembarked, wishing us a pleasant journey up the Bay to Annapolis, I had the crew strike the Q flag and hoist the US courtesy flag. We were now legally cleared into the US. It seems that this season many of my beginning sail students have discovered the miracle and wonder of reefing! I think too many people have seen images of sailboat races with vessels heeled at 45°. We cruisers just don’t do this! First, the boats actually sail slower; second, when we have too much sail up, we can’t easily control the helm. So whenever the winds build toward 15 kts, we immediately put a reef in the mainsail. If the wind should be even stronger, as it was for our last ASA 101 class, we reef the main and the jib. Why? The boat sails faster, flatter, and easier. Instead of fighting the helm and the heel, everyone will have a great time! What do you do when you encounter 50 kt winds, heavy downpour, and 16’ seas? Check for the correct answer in next month’s newsletter. It’s time to review and practice your knots. This month, try the square knot, used to join two lines of the same diameter and material. Hold an end of the line in each hand. Wrap the line in your right hand around the line in your left. When done correctly, you’ll have switched the two ends from one hand to the other. Now wrap the line in your left hand around the one in your right hand, and you have completed the square knot. If it doesn’t look like the picture, youve tied a granny knot! Time to start over. Practice this knot until you can tie it without thinking. It’s standard practice to check the marine weather before casting off the dock lines. When you’re planning a 4-day cruise, like our ASA 104 Bareboat Charter Class, this can be a problem. Most weather forecasts are only accurate for 24-36 hours. After that, the upper winds begin to change, and the forecast changes. Case in point is my 104 class in May. The forecast for the first day was for rain to begin during the late morning. and to continue throughout the afternoon, evening, and night. The sun was shining with a very nice 10-12 kt wind from the southeast, almost perfect for our short sail to the Wye River and overnight anchorage in Shaw Bay. Throughout the afternoon, the sun continued to shine, but clouds began to build to the west. Just as we were relaxing and thinking of setting up the grill, the rain began to fall, so we simply cooked our chicken on the galley stove. We always plan our meals to be flexible! When we settled down for our first night’s sleep, the rain continued to drum on the cabin top. I don’t know about you, but rain on the roof, or in this case on the deck, is just about as good as counting sheep. Of course, we had checked the forecast for the following day – heavy RAIN all day, and strong winds. In the morning, rain still washing the deck, we saw blue sky approaching. We cooked our breakfast, relaxed, and waited for the blue skies to arrive. We set sail and headed for Annapolis. Remember those heavy winds? Well, we had light and variable winds for more than half our sail. North of Thomas Point, one student voiced her pleasure in the good weather instead of the projected rain and wind. Too late! Never tempt the weather gods! As I moved forward to drop the mainsail for our final approach to the harbor, one lone storm cloud miraculously appeared overhead and dropped buckets of rain on Zufrieden and me without my rain gear! The forecast for our third day’s sail to the Magothy River called for strong winds out of the north, and waves 3-4’. We found ourselves needing to motorsail north under the Bay Bridge and into the Magothy where we had some very nice wind. We did our MOB drills and sailed into the anchorage. That evening, as we grilled our salmon steaks and zucchini, we watched the start of the Wednesday night round the buoy race from our ringside seats! During our last night, the weather forecast finally caught up to us. The winds picked up to 15kt with gusts to 20kt. When we set our anchor, we made sure we had a good firm hold, so despite the stronger winds, we had a safe night on the hook. As we prepared for departure, we reefed the main, had a great broad reach down the river to the entrance, then headed up to a close haul for our beat across the bay. After clearing Love Point into the Chester River, we jibed and headed to Kent Narrows and home. The moral: always check the weather report and be prepared! If you’re ready to handle the worst weather, you’ll enjoy the moments when the forecast doesn’t live up to the bad report. If you are planning to sail more than just overnight, always be ready for a major change in weather. Here on the bay, our weather patterns flow from west to east and change every 3-4 days. When you’re ready to experience a great 4-day voyage, come join us at R&R Charters and Sail School! Part of every sailing experience is provisioning your vessel. 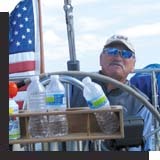 For a day sail you’ll need to be sure to have lots of fresh water available for you and your crew. ASA recommends 2 quarts to 1 gallon per person per day, depending upon the temperatures. You’ll also want to have some snacks. Mixed nuts are always good, along with something salty like chips or pretzels. Don’t forget to plan your lunch. You may just want to bring some sandwiches from home, but you’ll need to have some fresh fruit, and maybe some fresh vegetables and dip. And of course you’ll want something sweet! I would suggest some chocolate or home-baked cookies. Yum! to sail on your own yet. You can always book Zufrieden for a captained charter for a day, a weekend, a week, or maybe just a sunset sail. 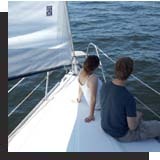 Naturally, you’ll be allowed to take the helm and gain some great coaching as you enjoy the waters of the Chesapeake. 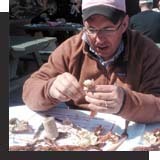 It’s the beginning of the new boating season, and thoughts turn to crabs and crabbing. In an earlier issue of BoatBuzz, I wrote about my sampling of Cream of Crab Soup up and down the bay. It’s one of my favorites, and Annie’s Restaurant at Kent Narrows still holds the number one spot! Although I’ve had some other very good ones at many spots around the bay, I personally don’t care for Maryland Crab Soup, which is more of a vegetable soup with crab meat, rather than beef. But don’t let me prevent you from sampling this specialty, too. Many of our students and charterers enjoy picking steamed crabs. Recently, I had a great British couple from a small town near Stratford on Avon, aboard Zufrieden for a two day charter. The husband couldn’t wait to have steamed crabs, so naturally, I made arrangements to dock at The Crab Claw Restaurant in St. Michaels. While his wife enjoyed a plump and juicy crab cake, he picked and ate his entire dozen steamed crabs trapped locally in the Wye River. My grandson Aaron, enjoys trying to catch his crabs on a line or in a trap. When we have enough, we steam them and pick the meat to make our own wonderful crab cakes. There’s nothing like the taste of fresh picked crab meat, but I prefer it in a crab cake. I just don’t have the patience to work for an hour, picking enough crab meat to make a filling dinner – I’d rather chow down on a ridiculously large broiled crab cake with some fresh corn on the cob! Don’t miss our Maryland blue crab season! Maybe, you’d like to try catching your own meal while sitting at anchor in Wye River or Swan Creek. R&R Charters and Sail School wants to remind our students you have the opportunity to charter Amici, and practice what you’ve learned! For a reasonable hourly rate, we’ll charter to students who have completed ASA 101 Basic Keelboat or ASA 103 Beginning Cruising course with R&R. Simply drop us an email with your dates and time, we’ll block you in, and send you an eInvoice for the fee. Remember classes only present the knowledge and skills, practice develops proficiency. Completing R&R’s ASA 104 Bareboat Charter class, qualifies you to charter Moondance for an overnight or weekend cruise on your own! She’s a fast, small, cruising vessel, and will sleep four adults comfortably. Imagine sailing to Wye River, St. Michael’s, Annapolis, or any of the other great sailing destinations within just a few short hours of our marina. Picture yourself standing at the helm piloting Moondance to her mooring or anchorage, then relaxing in the cockpit while a great evening dinner sizzles on the grill and crabs tug at your line. Sailing is not just a pastime for us. It truly is a way of life and a passion. All those daily stresses are casted off with the dock lines. Whether you choose to sail Amici for a few hours or Moondance for a weekend, you will return to the dock refreshed and ready to face another long week of work. Come join us and become part of the sailing community. 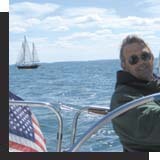 Many scheduled sail classes in May through mid June are nearly full. Others from mid June through September already have some spaces filled. Don’t wait any longer to register for your next sail class! We really don’t want to turn anyone away! 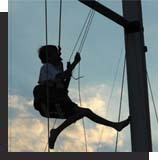 R&R Charters and Sail School prides itself on giving our students top quality instruction and sailing experience. 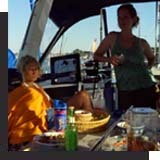 Come join us for the fun in 2012, and perhaps next winter you’ll be on your own SunSail charter in the BVI. Maybe you don’t feel comfortable enough to sail on your own yet. You can always book Zufrieden for a captained charter for a day, a weekend, a week, or maybe just a sunset sail. 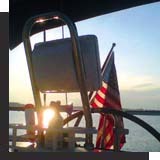 Naturally, you’ll be allowed to take the helm and gain some great coaching as you enjoy the waters of the Chesapeake.